Take a summer-long tour through my garden. 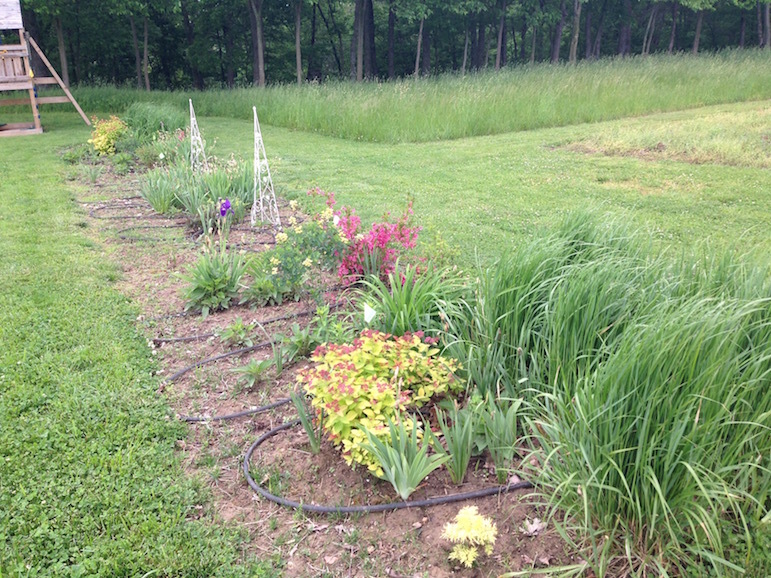 You hear me talk about my garden every month in the newsletter, so I thought I would show you a few photos so you could actually see what I am doing. 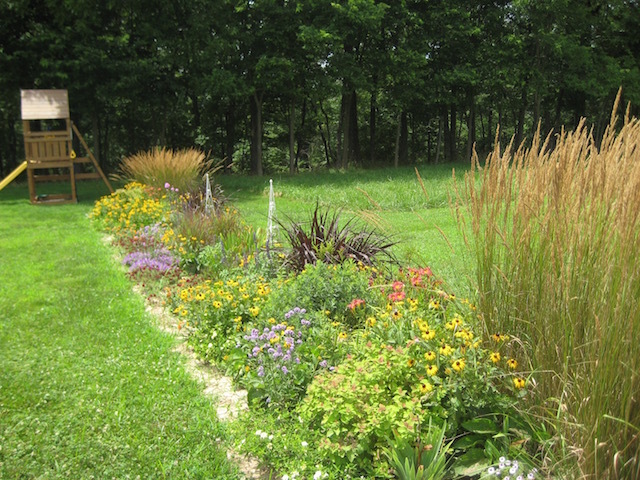 Kerry lives and gardens in central Missouri on 10 acres, half of which is a rocky wooded hillside. She and her husband bought their house in 2005. They, along with their daughter, now live mere miles from the small family farm where she grew up, near her hometown of around 300. Both of her grandmothers and her mother loved flowers and passed this passion on to her and she plans on passing this on to her daughter. 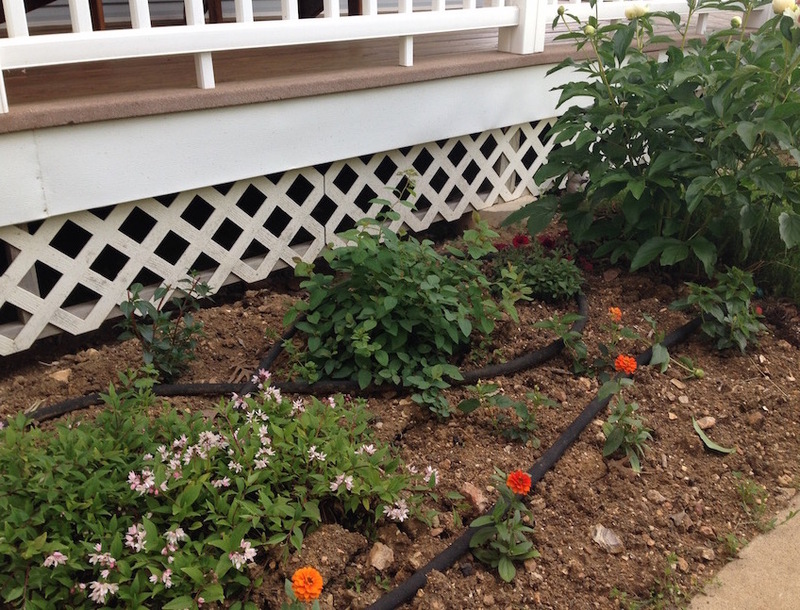 She expects her garden to continue to grow as she has time to add to and improve existing beds. Kerry has a BS in Horticulture from the University of Missouri and an MS in Horticultural Science with a minor in Plant Breeding from the University of Minnesota. After graduation she lived for 5 years on the Central Coast of California before returning to the Midwest. 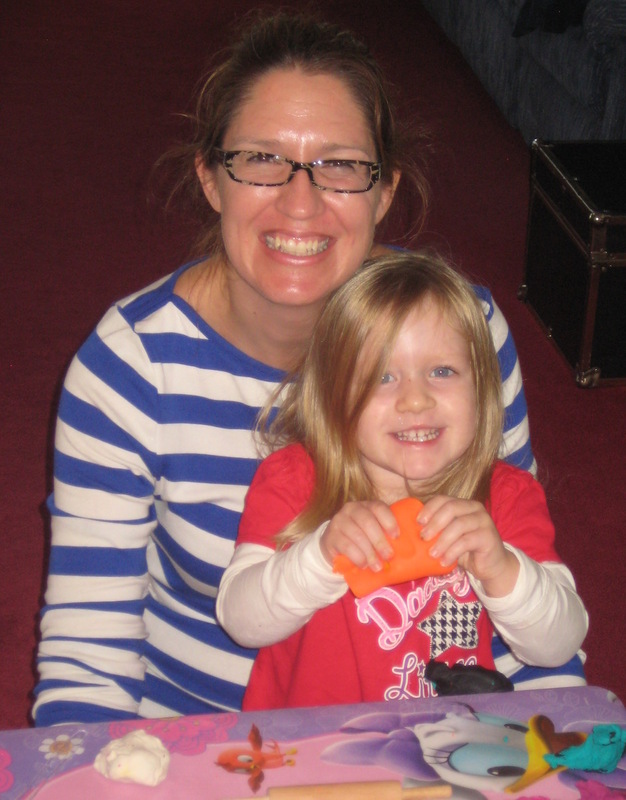 The photo on the left is of my daughter and I playing with play-doh in March of this year. There isn't much going on in my garden right now. We've gotten really, really dry. 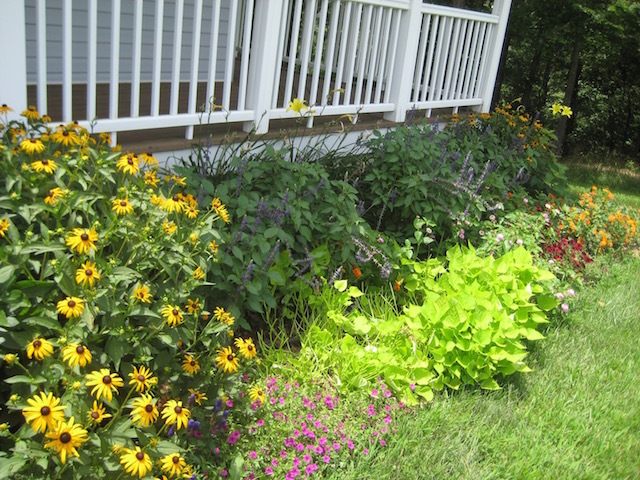 I'm watering to maintain my perennials and shrubs, but I've decided to let the annuals die - this late in the season it isn't worth the water to maintain them. 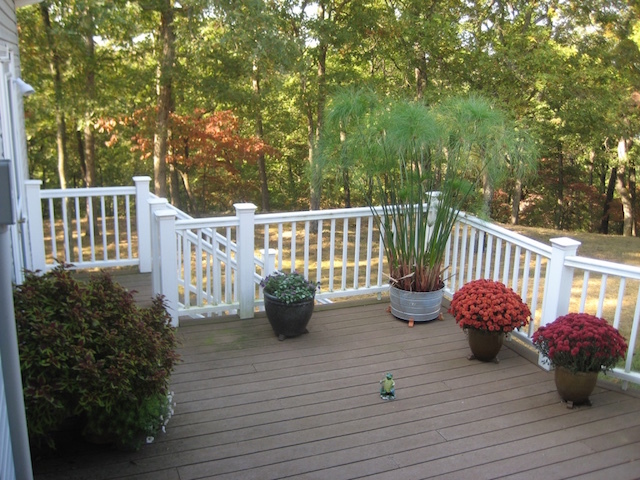 I do still have some containers looking great on the deck, including 2 mums that I bought through the local school sale. 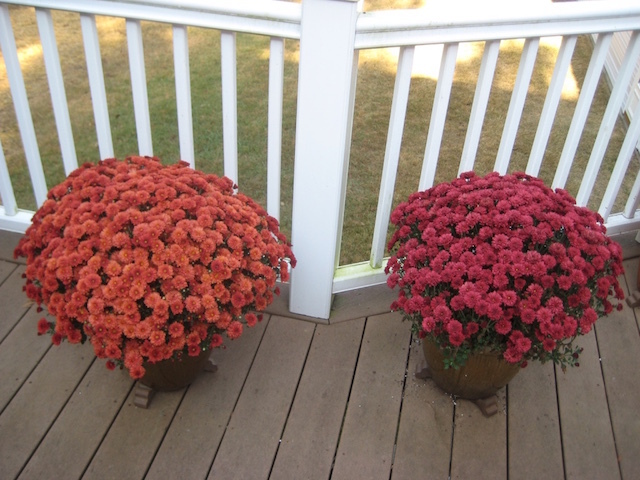 And this is why we all love mums - they look great! 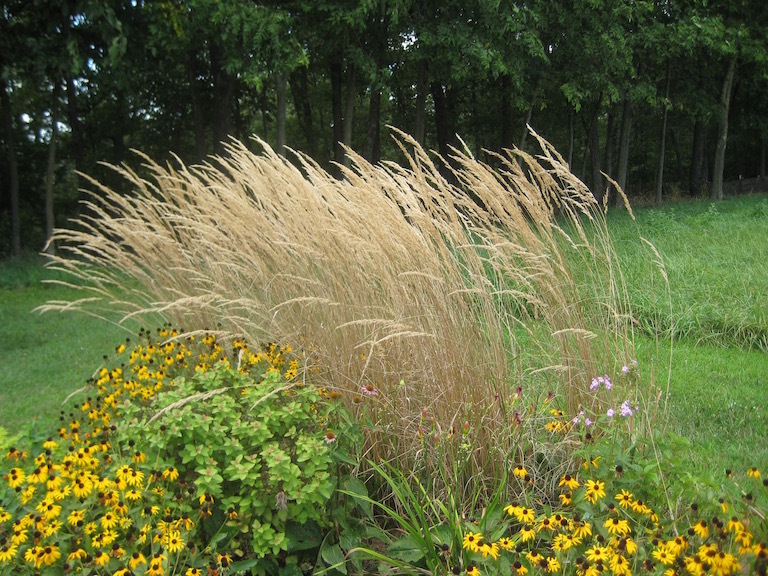 Graceful Grasses® King Tut® is still looking great as is this combo from the spring. 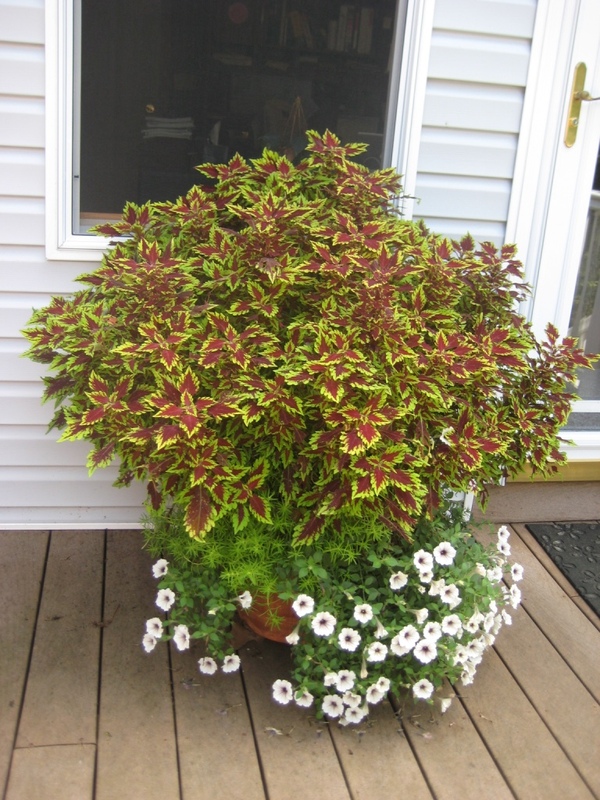 The coleus is our new ColorBlaze® Apple Brandy™ - one plant! The weather is supposed to be picture perfect (70's and sunny!) this weekend for spending time in the garden. I've got a mental list going of "chores" I can use as excuses to spend time outside and in my garden. My partial list of things to do: trim back the black-eyed Susans that are done blooming, thin them out some since they are trying to take over at least one of my beds, cut back the Karl Foerster, check the newer shrubs and make sure I'm leaving them enough elbow room - I think I'm crowding some of them with annuals/perennials/bulbs and room would help them thrive, remove tired annuals, add compost once I get the beds cleaned out (might be more for later), dig and divide Prairie Winds™ 'Cheyenne Skies' Panicum - I love it but I think it would be better in a different spot and with more plants together in a group, potentially trim back some shrubs that suffered when I didn't water enough once the rain stopped, consider perennials or shrubs to plant this fall and go shopping for them (Daisy May, Decadence Lemon Meringue to name two). Can't wait! So what's still looking good this late in the season? 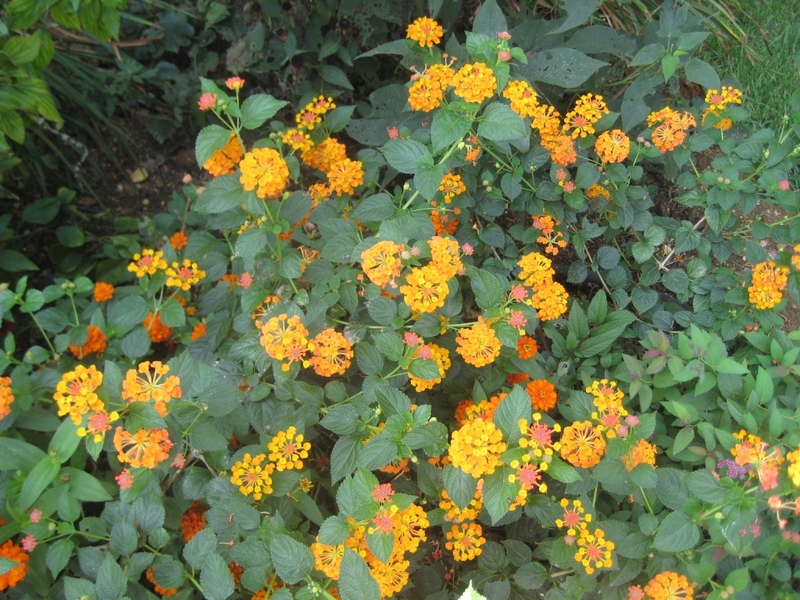 Two of the stars right now are my Sedum Neon (below left) and Luscious® Marmalade Lantana (right). I do love tough plants that look good in the fall. I did clean up a lot of my containers a couple of weeks ago. I kept a few that were still looking great. 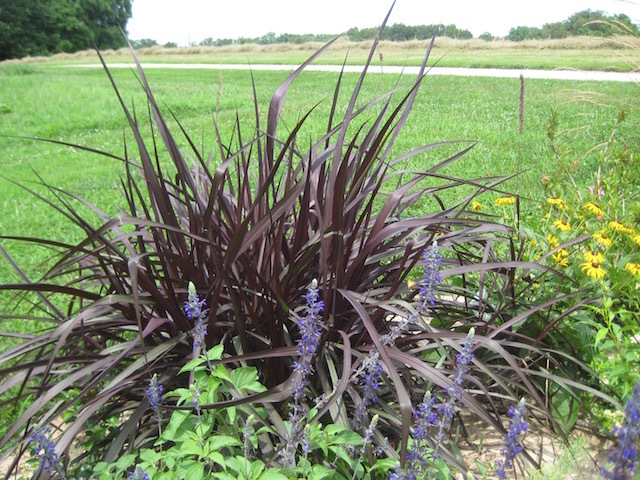 Graceful Grasses® King Tut® is just an absolutely awesome plant! I did have to trim it up several times when stems bent over and creased - it often coincides with the container getting on the dry side. 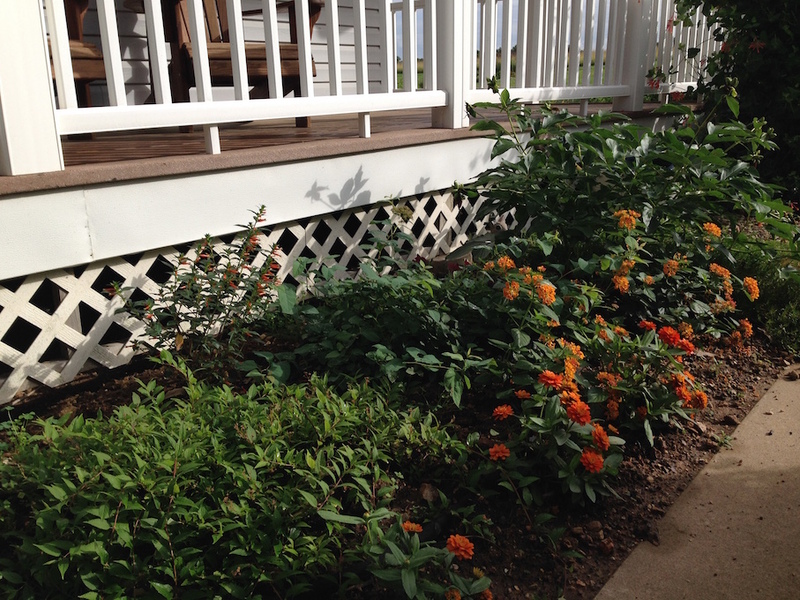 The ColorBlaze® Apple Brandy™, Supertunia® Latte and Lemon Coral™ Sedum combo weathered everything that spring and summer threw at and looked good doing it! (right, below). Back in July when I last posted photos, I included the one on the left of Superbells® Holy Moly!™ struggling after all of the rain followed by very hot temperatures. I was hoping I could bring it back. As you can tell from the photo on the right, it has bounced back really well. I saw good progress within about 10 days. So what did I do, exactly? It was two simple things. I made sure I was watering as needed only, proper watering was the biggest thing. Since these plants had spent months being inundated, making sure the soil dried out without getting too dry was the first key. The second piece of the puzzle was feeding the plants. The massive amounts of rain not only kept the soil soaked, it washed the fertilizer out of the soil. 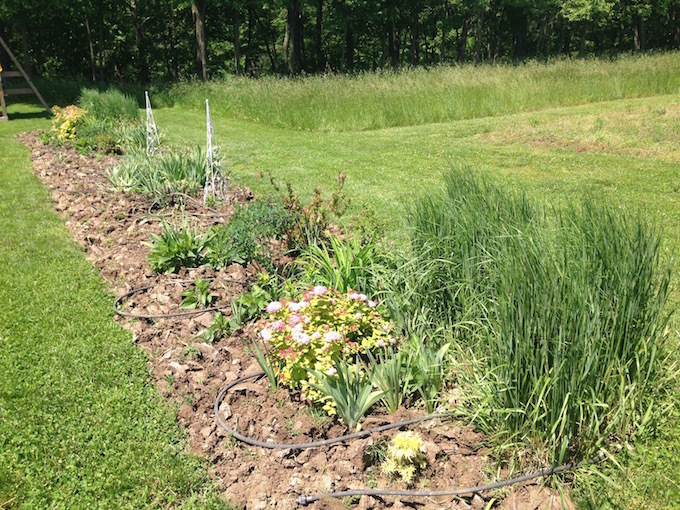 As soon as the soil dried out enough I watered with our water-soluble fertilizer, mixed at the normal rate. Then I continued to feed the plants once a week. 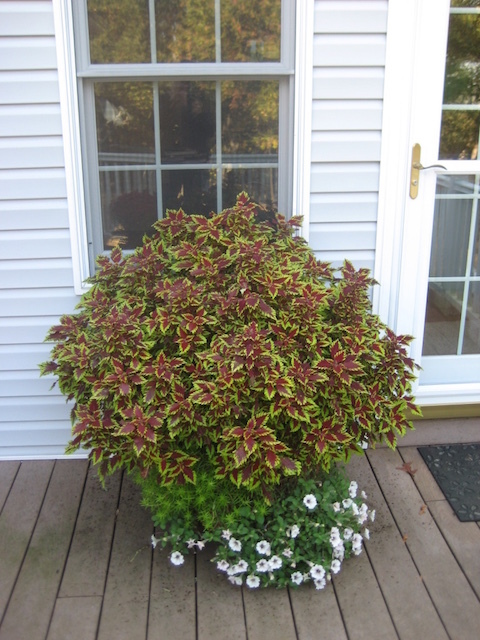 While it isn't flowering profusely, the plant has bounced back incredibly well. Graceful Grasses® King Tut® and the ColorBlaze® Apple Brandy™/Supertunia® Latte/Lemon Coral™ combinations both look great, too. 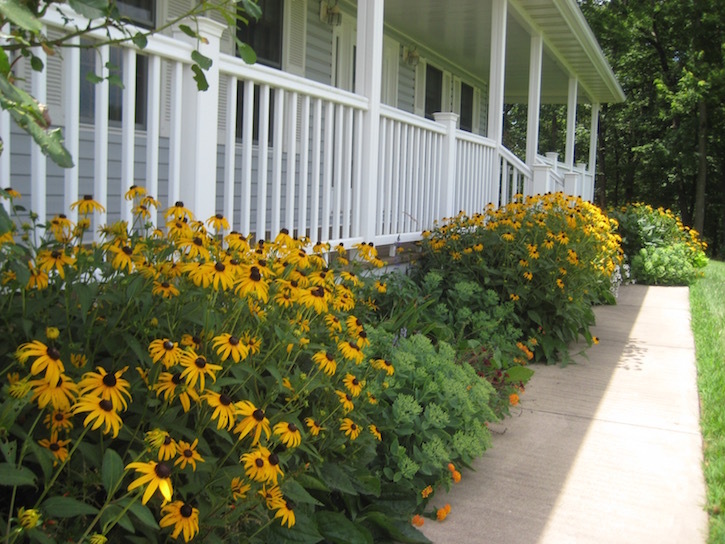 The front beds are looking really good, in large part due to the black-eyed Susans being in full bloom. They have taken over a bit too much real estate in these beds. I do want to winnow them down a bit, but I find it hard to get rid of plants that are such great performers every single year. 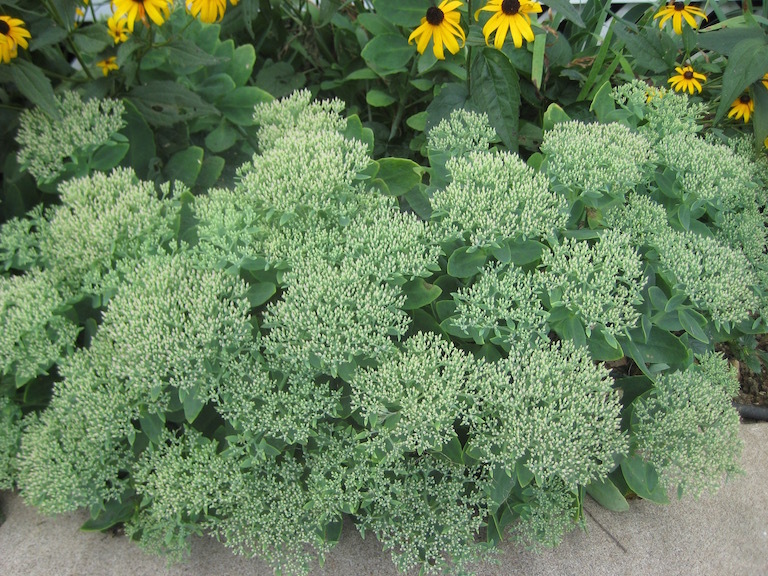 My fall blooming sedum are looking fantastic, fully budded and just waiting to pop. In a couple of weeks, they will be the stars of the show. 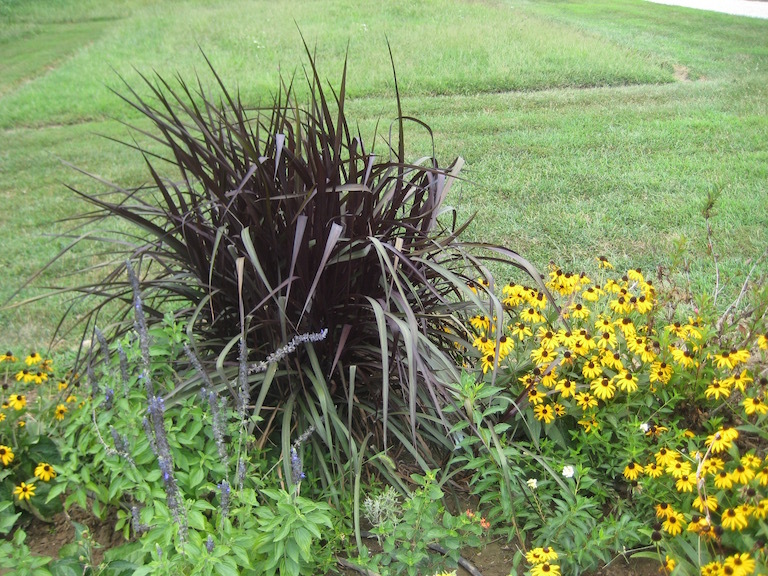 My stars of my biggest bed, along with the Black-eyed Susans, are the ornamental grasses. 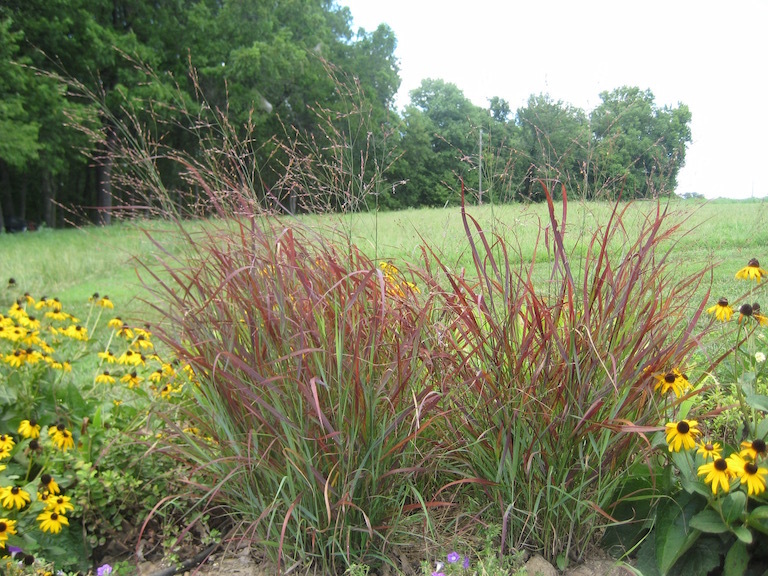 Left to right, Prairie Winds™ 'Cheyenne Skies' Panicum, Graceful Grasses® Vertigo®, and Karl Foerster Calamagrostis. The rain has finally stopped for more than 2 straight days. I actually needed to water my containers twice this week already, after watering only 3 times since May 15th, when I planted them. It looks like watering every other day is going to be the norm now. Thank goodness! We had the wettest June on record since the 1880's this year and July started out just as wet. All of that rain took a toll on my plants. Normally I would expect my containers to fare better than my in-ground plantings, but on the whole that wasn't true, my garden beds have weathered the weather better than the containers. Below is Picasso in Burgundy and it is looking fantastic! 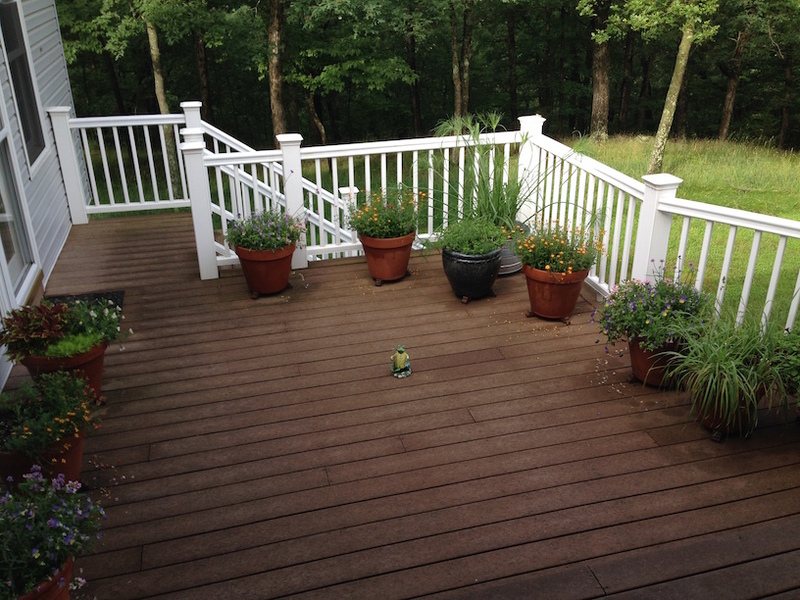 On the other hand, Superbells® Holy Moly!™ did great through the rain, looking awesome until the temps soared about 90. Once that happened disease pressure really took its toll. I fertilized the last time I watered and I think the plant is getting a bit better. I'm hopeful that it will continue to improve and I think it will do so as long as we don't get inundated with more rain. 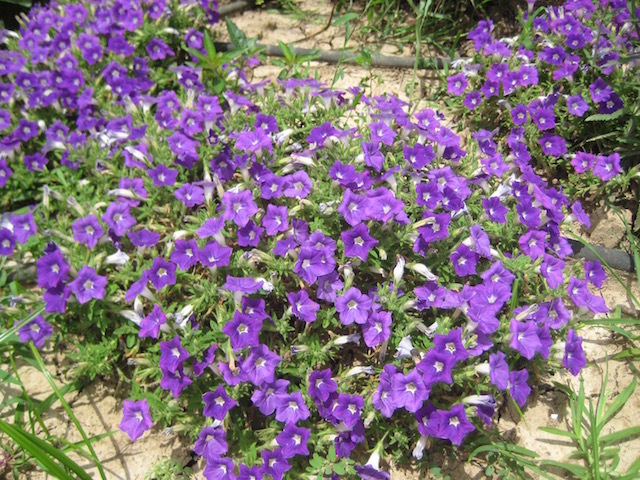 Usually Calibrachoa are not a plant that I would ever plant in the landscape. However, this year we introduced a new type of called Superbells® Garden Rose. 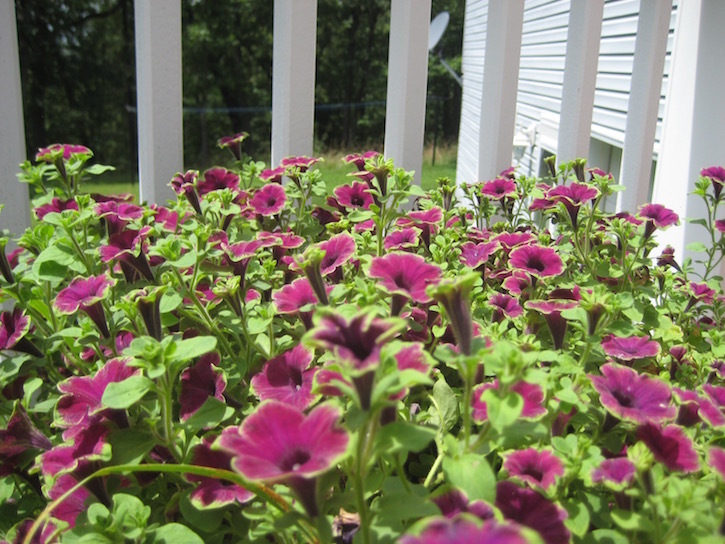 This plant has true in-ground performance and none of the root and pH issues that can cause problems with other Calibrachoa. 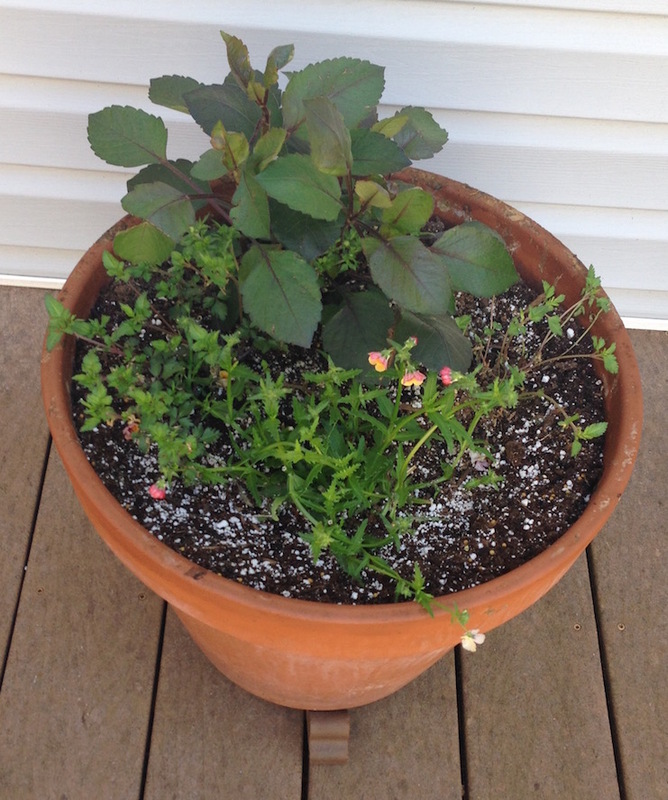 Superbells® Holy Moly!™ is on the left, you can see the dead stems if you look closely at the photo, and Superbells® Garden Rose is on the right growing in the ground, it is perfectly green and flowering like crazy. The extreme rain we've had was a great test of its garden performance and it has done beautifully. 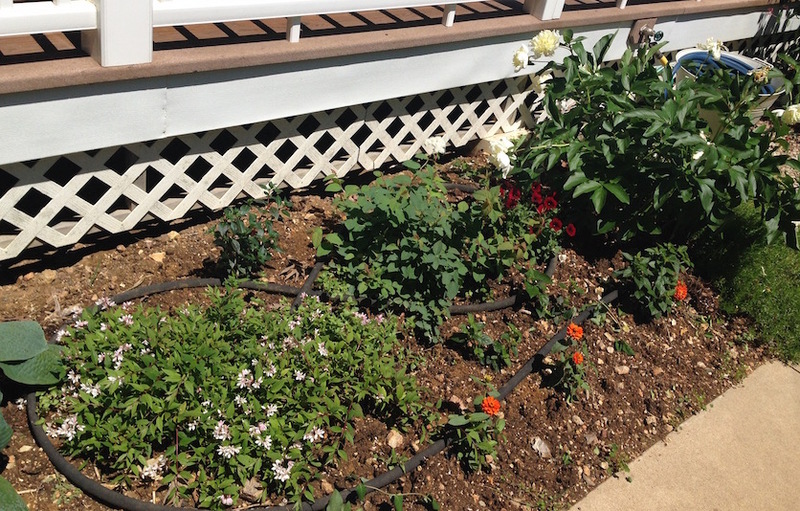 The garden beds around the house are looking pretty good, all things considered. 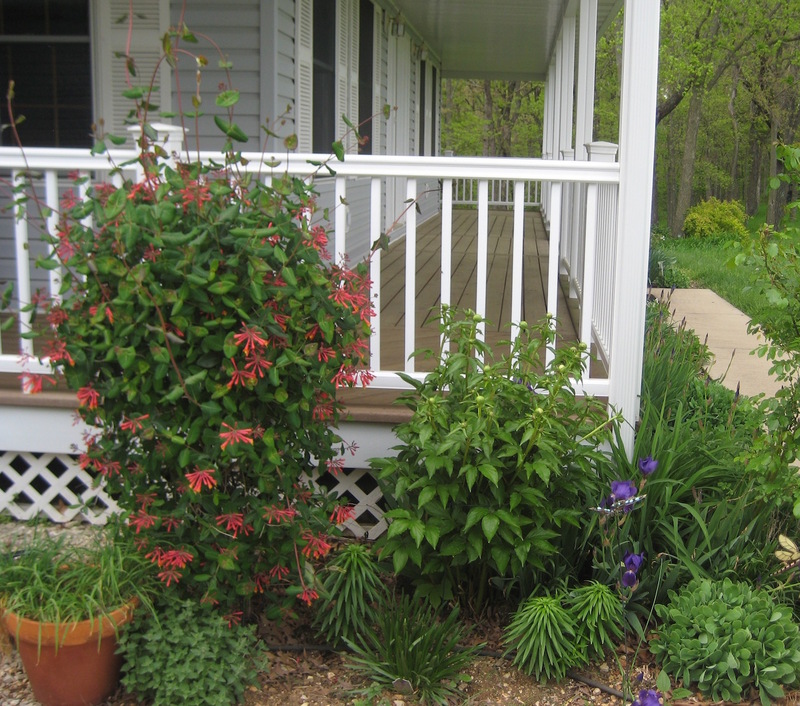 I went with oranges and reds in the bed closest to the kitchen steps (photo, left) and on the left side of the front porch (photo, middle). 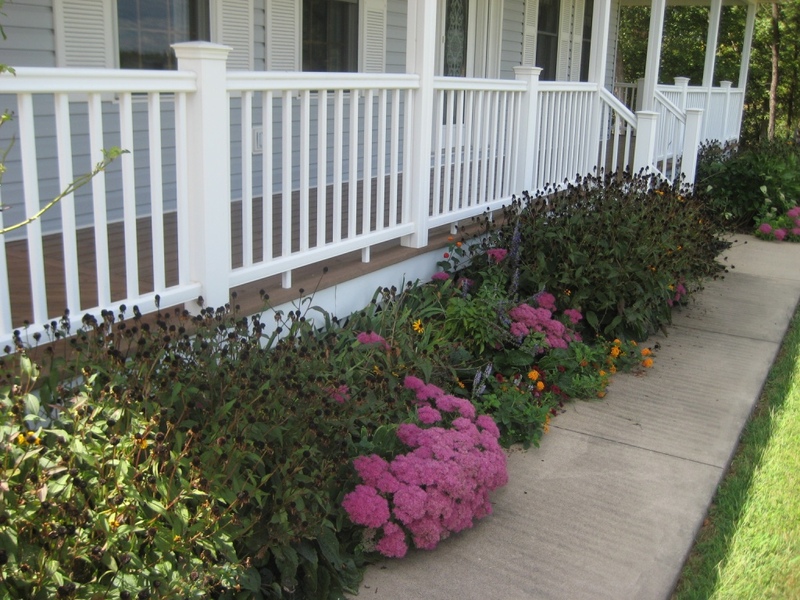 The photo on the right shows the combinations in front of the porch, they are doing great! 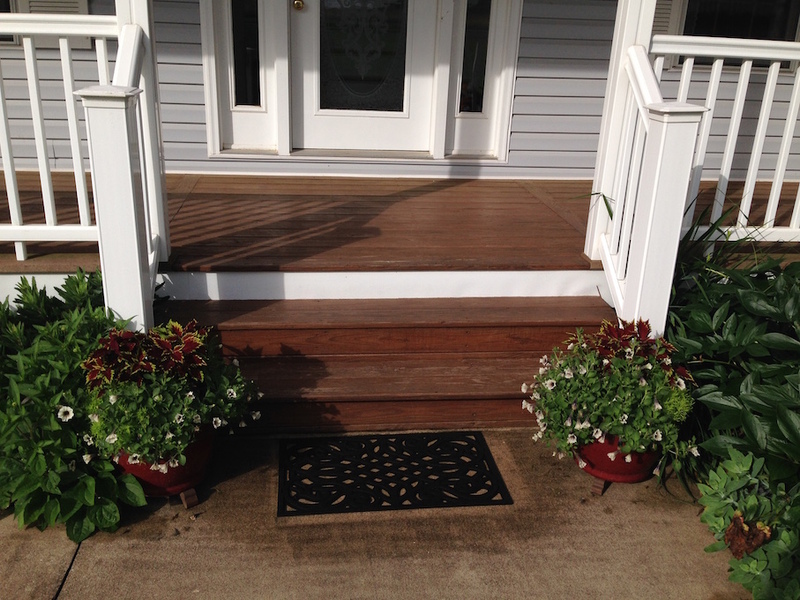 The plants in them are Supertunia® Latte, Lemon Coral Sedum and ColorBlaze® Apple Brandy™. My largest bed is looking OK. Planting when it was really too wet to plant, followed by all of the rain (and the resulting rampant weeds) have taken their toll, but all things considered it is looking decent. 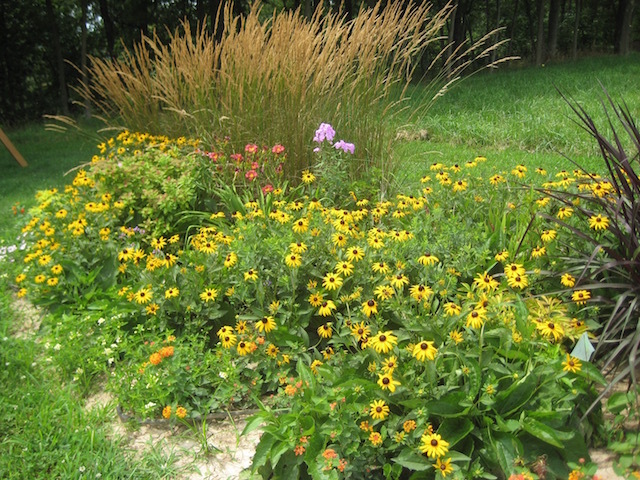 With the Black-eyed Susans in full bloom, I've got some good color going at least. 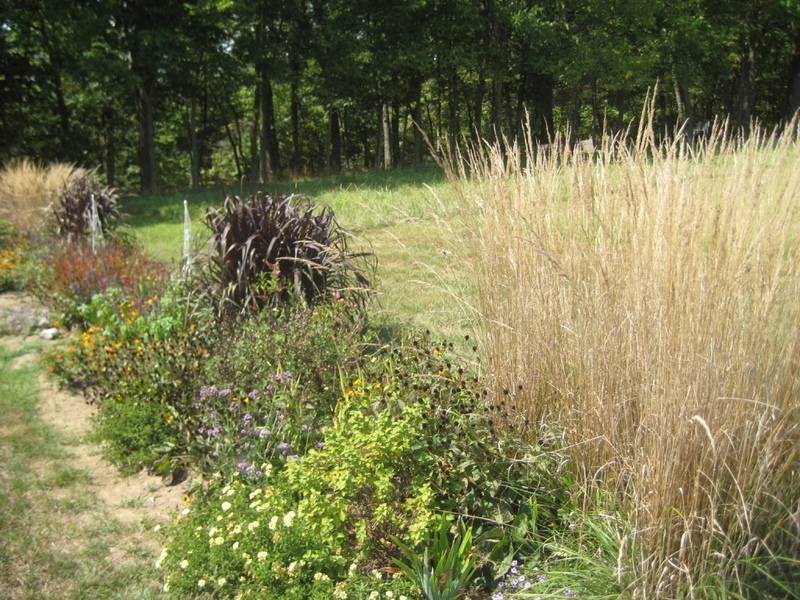 Here are three close ups from the bed.The photos on either end higlight Graceful Grasses® Vertigo®, which dovetails nicely with the article I just wrote about using black plants in your garden. This annual gets large quickly and is a great temporary focal point. 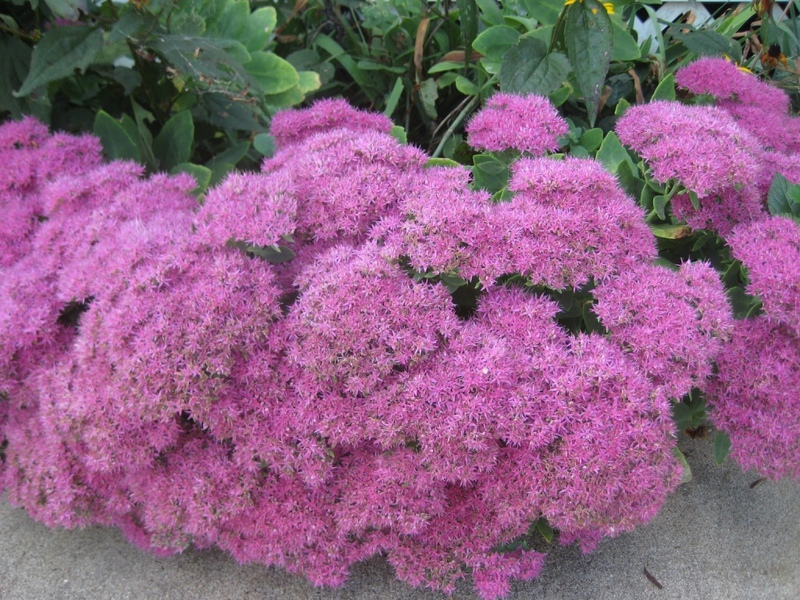 It can grow 4 to 5 feet tall in one season. 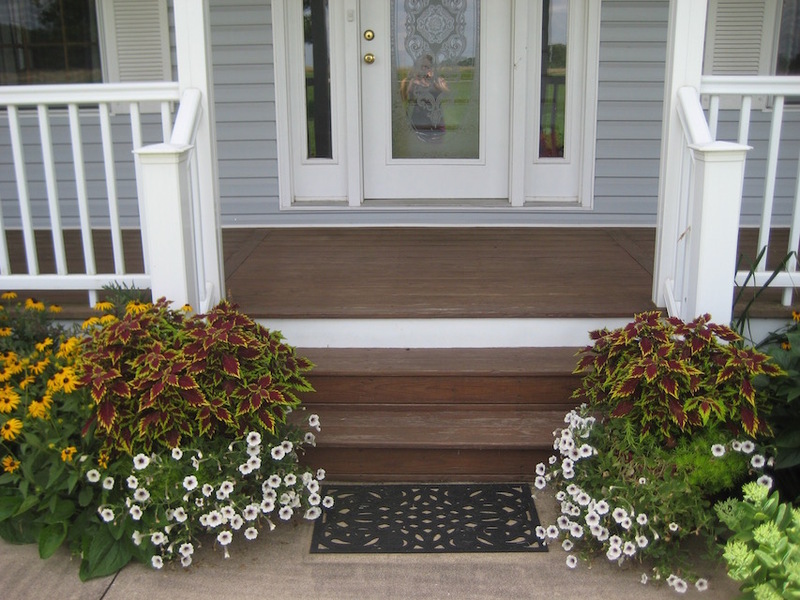 The middle photo is Supertunia® Morning Glory Charm which is doing truly fantastic despite the weather! Rain, rain, go away come again another day... Like maybe two weeks from now. We desperately need some sun to dry out super-soaked soil. Yesterday we got 3 inches of rain, not to mention the days on end of rain before that. Today? More rain in the forecast - remnants of Hurricane Bill:-) So all of my pictures are a bit water-logged. If we actually get some sun, I'll try to get a new set of photos posted up. 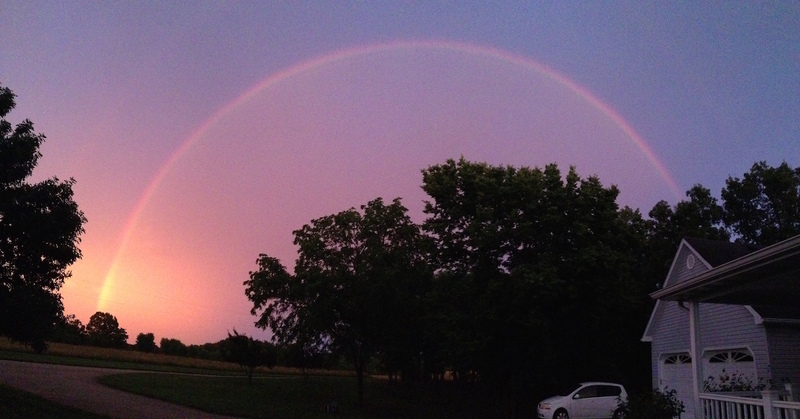 Not that rain is all bad, we did get this view one night! The planters are growing well. I did lose one Dahlia from the continuously soaked soil, but the rest of the plants are growing well, although obviously a bit weary from the weather. The garden is not only water-soaked, but weed infested. I think by Sunday the rain should stop and maybe, maybe, maybe I can get the weeds pulled. Some sun would certainly help the flower power. I really miss the sun! 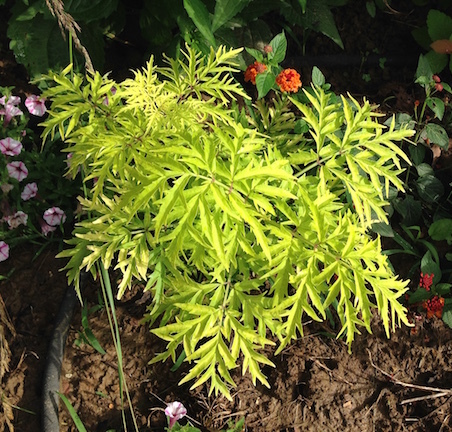 The plant on the right is Lemony Lace™ Sambucus and it is looking great! Apparently mass amounts of rain make it happy. 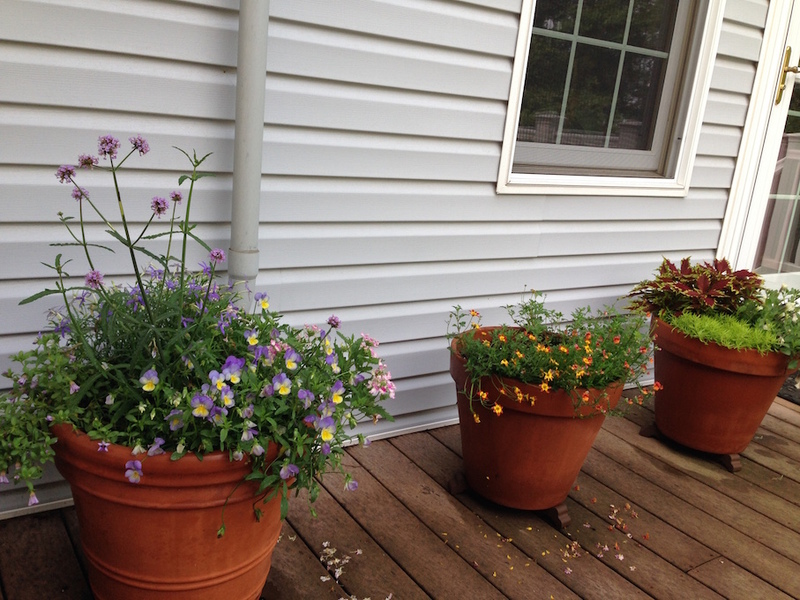 Since the newsletter this week is all about containers, I'm going to review my containers - which I planted last weekend. 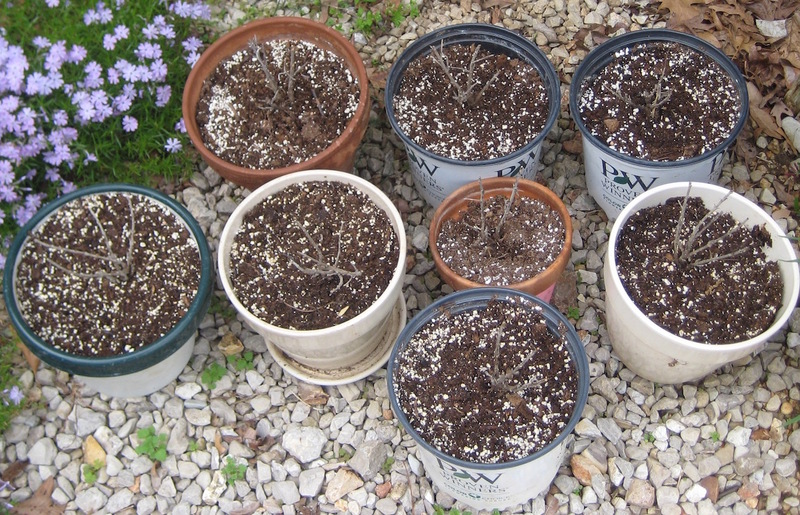 As usual, my containers are made from our new varieties that aren't yet available to home gardeners. Since the new varieties arrived before I got my garden planted, I am actually putting several of them into the garden this year. Which leaves me with only 12 planters. Here are the first three combinations, with multiple pots of each combo. 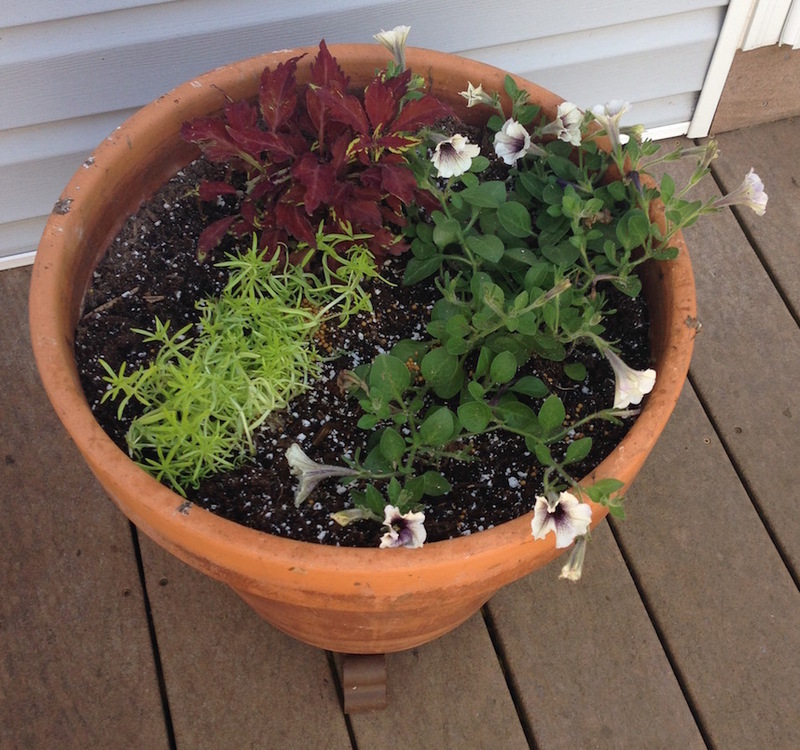 The first container from the left contains one each of ColorBlaze® Apple Brandy Coleus, Lemon Coral™ sedum and Supertunia® Latte Petunia. The middle container has one each of Dahlightful™ Georgia Peach Dahlia and Sunsatia® Blood Orange and two Campfire™ Fireburst Bidens. 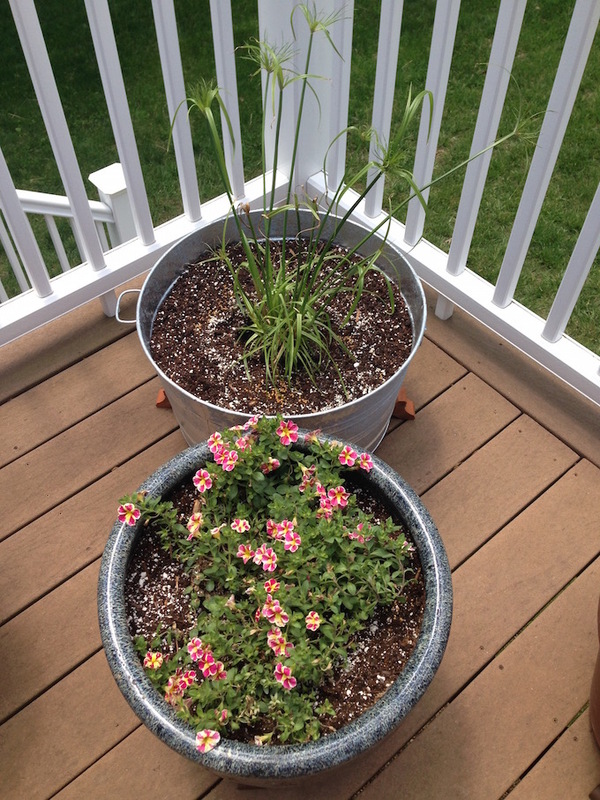 The container to the right has one each of Superbells® Evening Star, Superbena® Sparkling Ruby; Beth's Blue® Isotoma, Meteor Shower™ Verbena bonariensis and Anytime® Iris Pansiola. Here are the last three different kinds of combos. The combo on the left has one each of Dahlightful™ Sultry Scarlet Dahlia and Sunsatia® Blood Orange and two Campfire™ Fireburst Bidens. 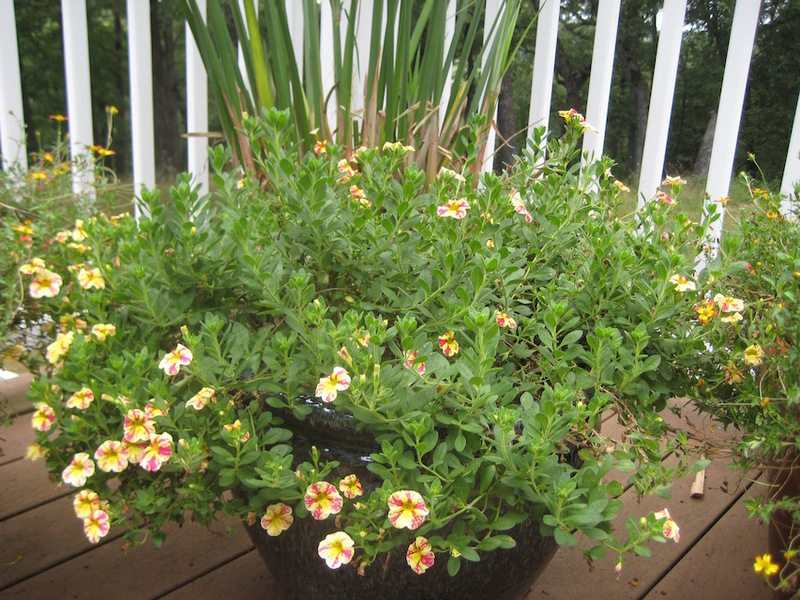 The middle pot has 5 Superbells® Holy Moly!™ Calibrachoa, with Graceful Grasses® King Tut® in the galvanized metal washtub behind it. 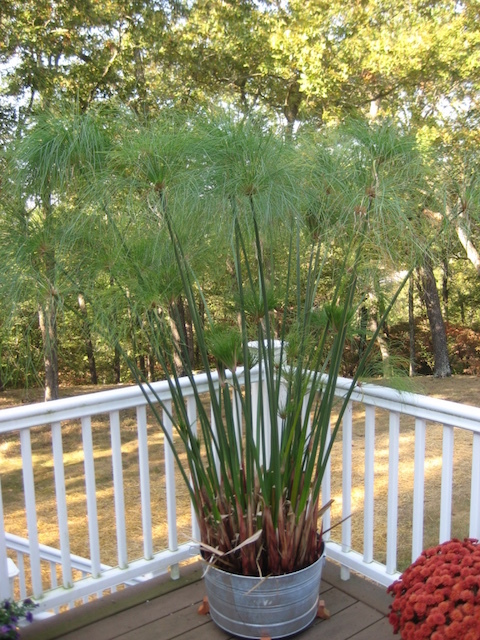 It has no drainage holes since that plant does well in pond edges. Since King Tut gets quite large and thus uses a lot of water, having no drainage means that I water much less often. 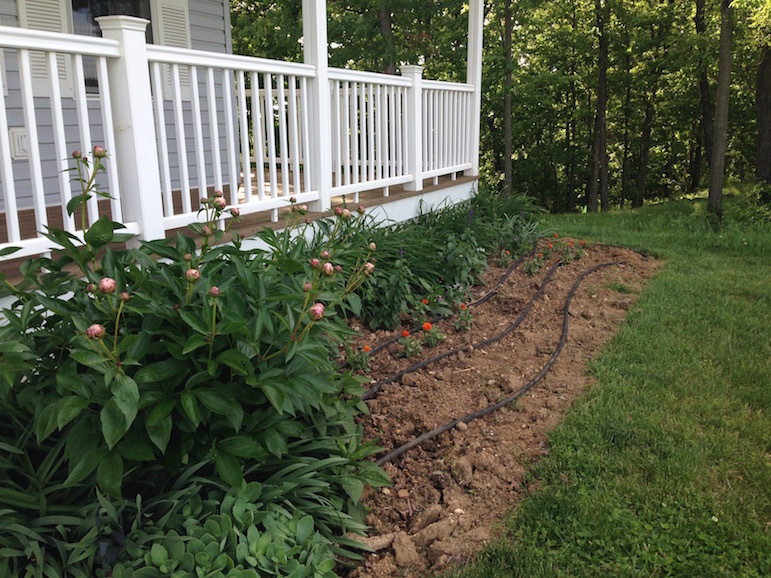 I did get the beds around the porch completely planted. The big bed (to the right) I got dug and turned and a few plants installed. But there is much yet to do. Wildlife in the garden. The hummingbird trio are still visiting the honeysuckle regularly. The new member is the woodpecker that has taken to drilling on one of the gutters. It took a couple of weeks to catch him in the act, but googling has determined that he is a red-bellied woodpecker and the drilling is to attract attention from the ladies. I'm glad he is using the metal gutter, not the siding on the house. I assume he likes that the metal gutter is loud! So that potential issue should self-solve once he has a mate - at least until next spring! I took another look at the rosebush on Saturday and decided that one of the reasons it was leaning over so far was the masses of wet and fading flowers. So i decided to deadhead. 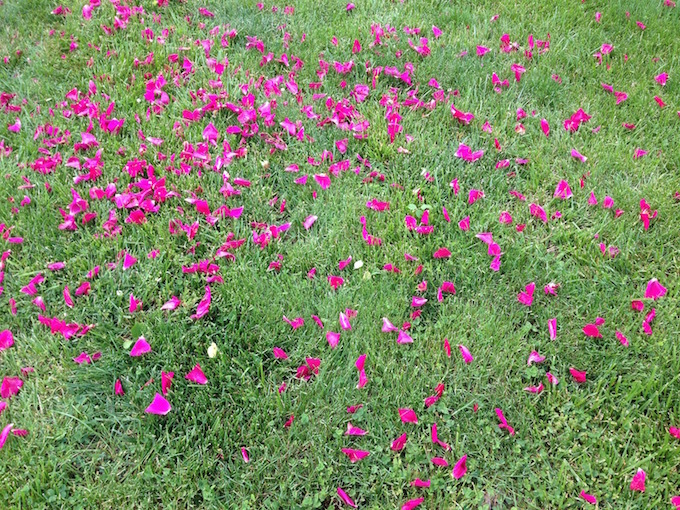 Then my daughter started picking up roses and shaking the petals off on the grass. It was really fun. I then trimmed back one of the peony bushes which had fallen over on top of some other perennials. 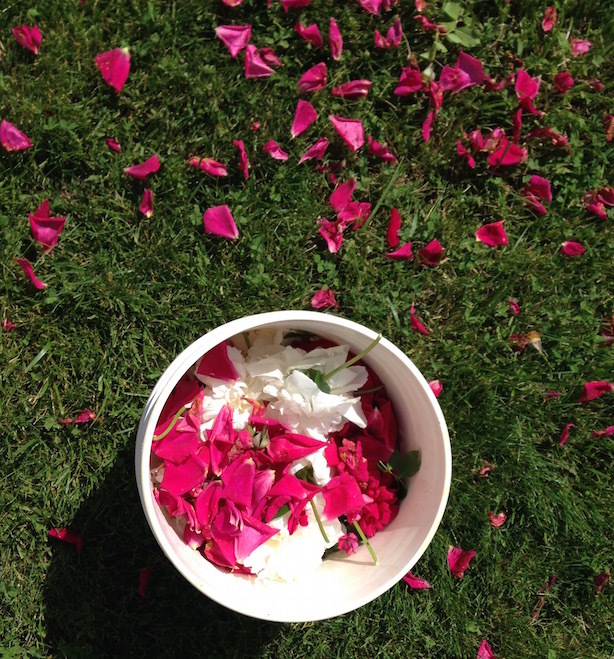 We ended up picking up all of the petals, which almost completely filled a 5 gallon bucket. After the trip to the compost pile, I had the prettiest compost pile in the land. To all of you that make your own potpourri - I'm sorry, you probably could have put those to good use... My husband did also help me haul the plant back upright! The photo on the left was actually taken a couple of weeks ago, and shows Dream Catcher™ Kolkwitzia just buried in blooms. How wonderful is that floral display? Right after I took this photo it started raining. We got rain on and off for 5 days and ended up with about 3.5 inches total. We really needed the moisture so I am happy to have gotten it, but I really need it to dry up on the weekend. I have maybe 1/4 of my beds planted and something (I suspect the neighbors cat) dug up 3 of the 4 Supertunia® Black Cherry I had planted. With all of the rain and general busyness I hadn't walked out to take a look at the new plantings for a while. By the time I saw the digging - it was too late to attempt a rescue. 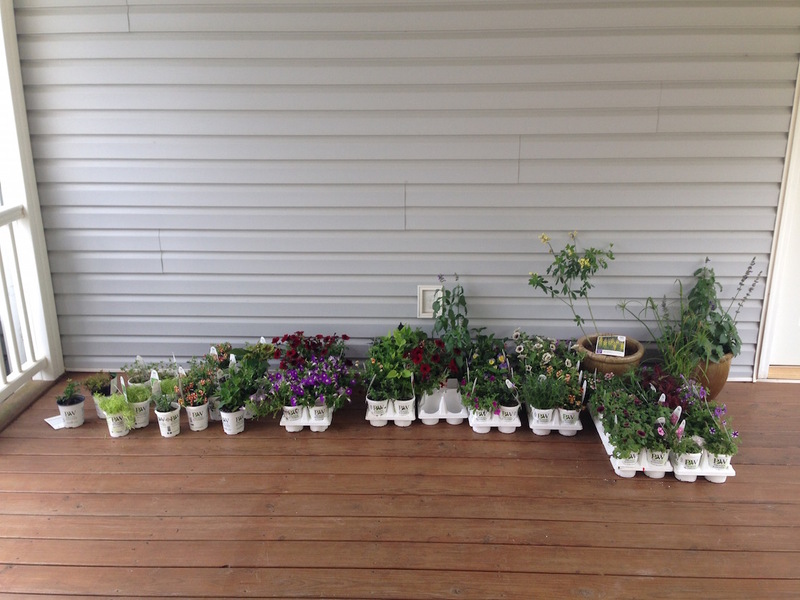 The photo on the right was taken today and shows the "holding pen" where plants hang out while waiting for the garden to dry out and me to find time to plant them. Come on good weather! 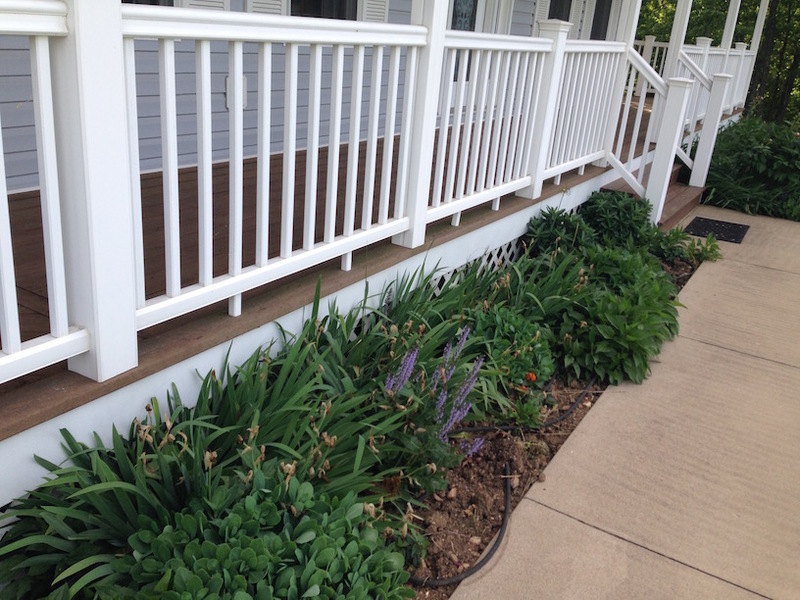 The bed by the porch steps is done (photos below).I planted two Yuki Cherry Blossom™ Deutzia and one Double Play® Blue Kazoo® Spirea in this bed last fall. 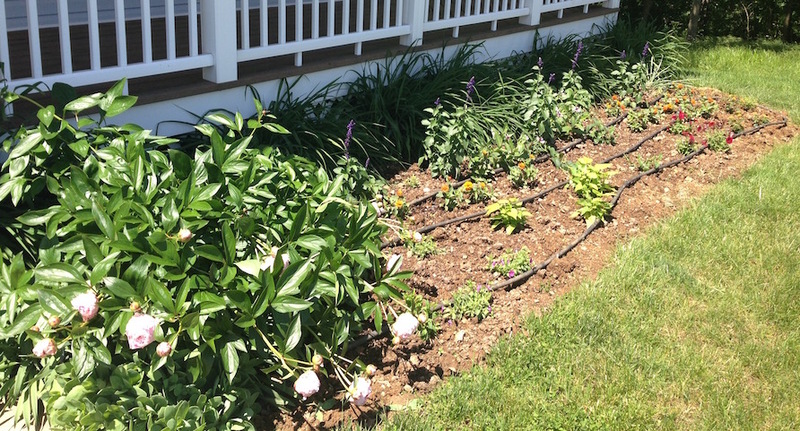 They are all small growing shrubs and should provide a good backbone for this bed. 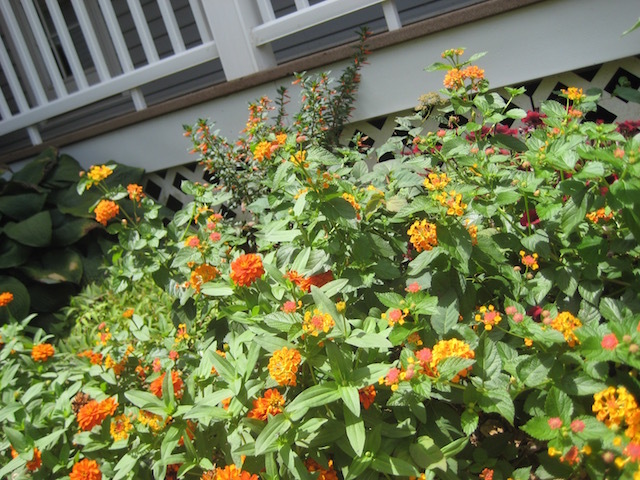 This spring I added one Vermillionaire™ cuphea - I wanted more of this one, but one was what I could find, some Profusion Orange zinnia and one Supertunia® Black Cherry - the lone survivor of the cat marauder. That is my daughter with this scissors harvesting a Peony bouquet. Which in this case was two flowers, each with a 2 inch stem. We made it work! This bed is really quite glorious right now. 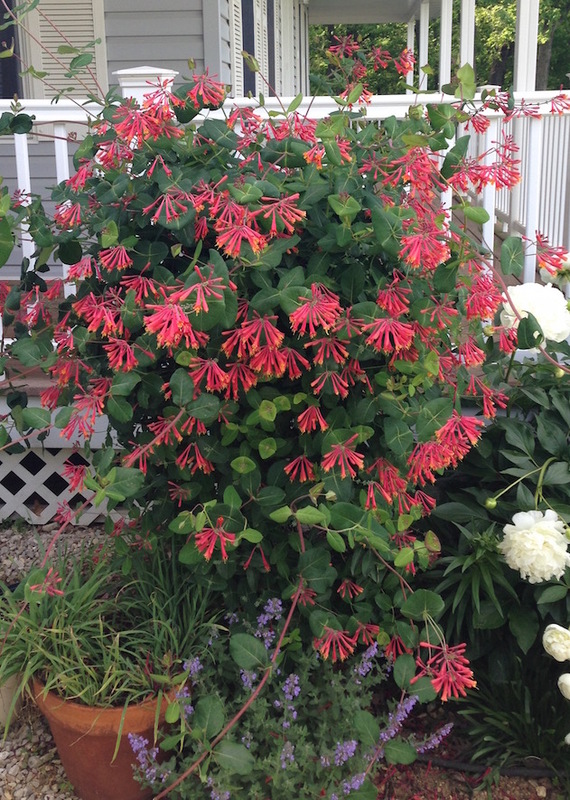 The honeysuckle is smothered in flowers and our resident hummingbirds, 3 this year instead of 2!, can be found dive bombing it in most daylight hours. They are probably wondering why I haven't gotten a move on and given them a variety of other choices to go along with the honeysuckle. I just need rain during the early part of the week, so I can plant on the weekend. 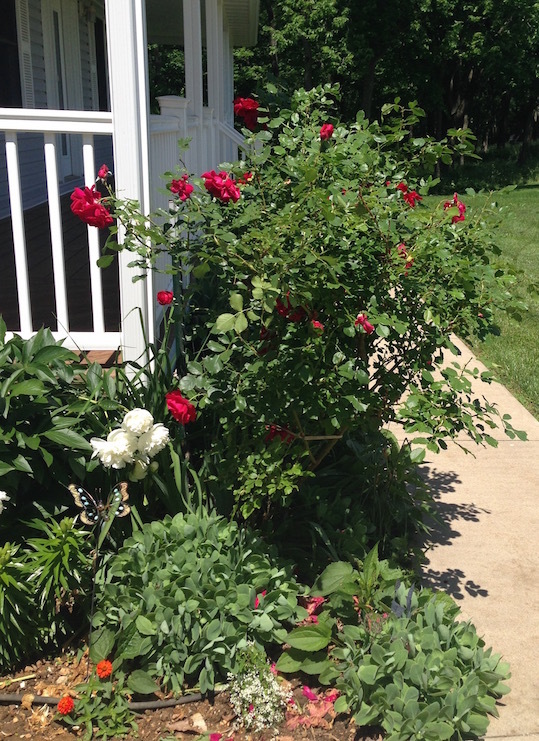 You can see that rose bush is leaning WAY over. A combination of 3 inches of rain, plus wind, plus a rather one sided plant has caused it to lodge. 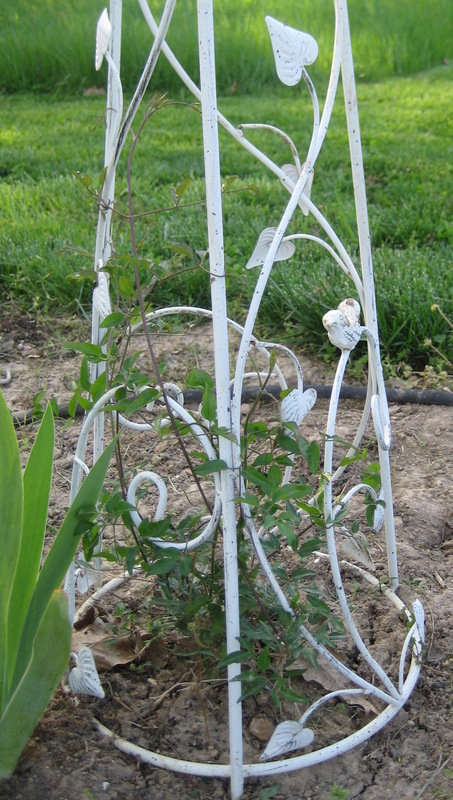 My plan is to spray paint a green and white fence post black (so it blends better) and then sweet talk my honey into driving it into the ground for me, then don thorn protectant clothing and hoist the rose bush back into place. In the meantime, check out those flowers! 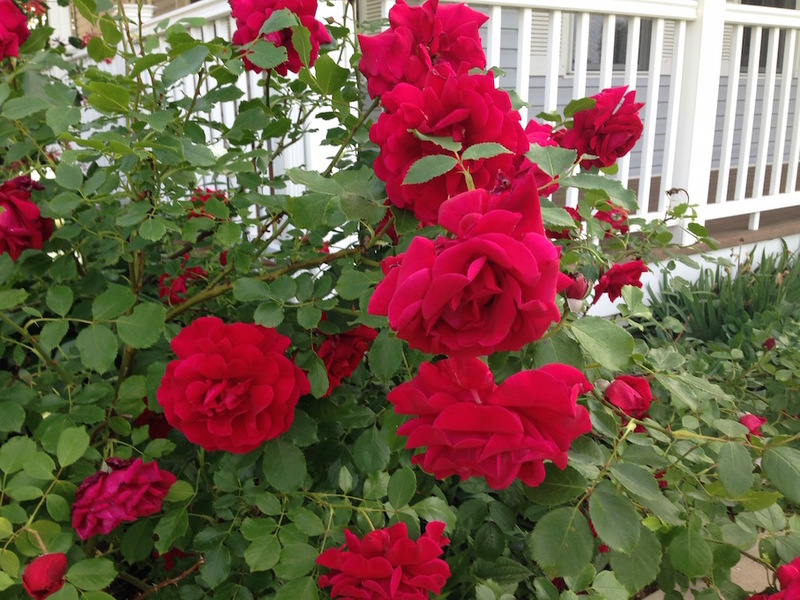 If you've read my garden info in previous years you know that this rose bush is from one that my Grandma planted quite some time ago, I'm guessing about 75 years ago, but could be wrong. I can't ask her, she passed away about 2 months before her 101st birthday a few years ago. The rose bush makes me think of her. As does my daughter saying ach, something I picked up from grandma and she's picked up from me. The first time I heard her say it, I almost cried. My daughter was born after my grandma passed away and this makes me feel like a bit of Grandma is being passed on to her great-granddaughter! 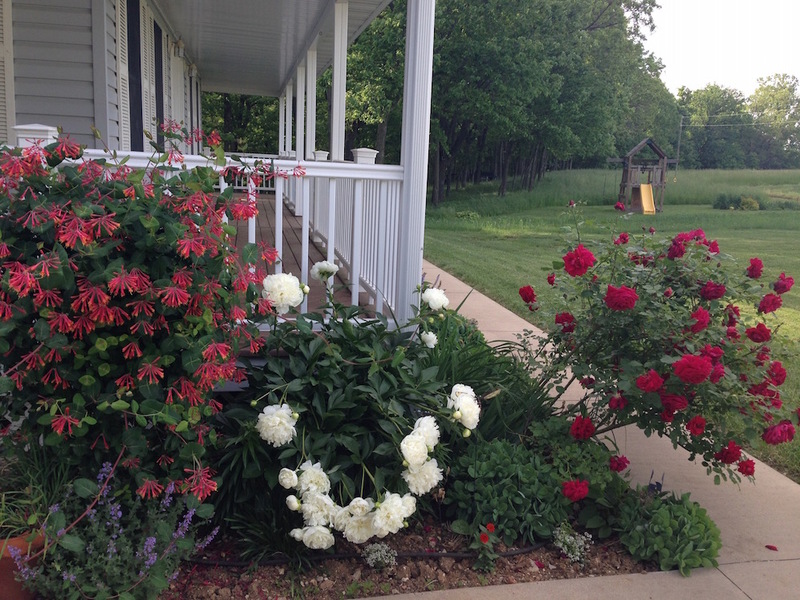 Below are the other two beds by the porch. I'm not done planting yet, but once I am I'll get you lists of what went into them I can say a red/orange/yellow/blue color theme is emerging! 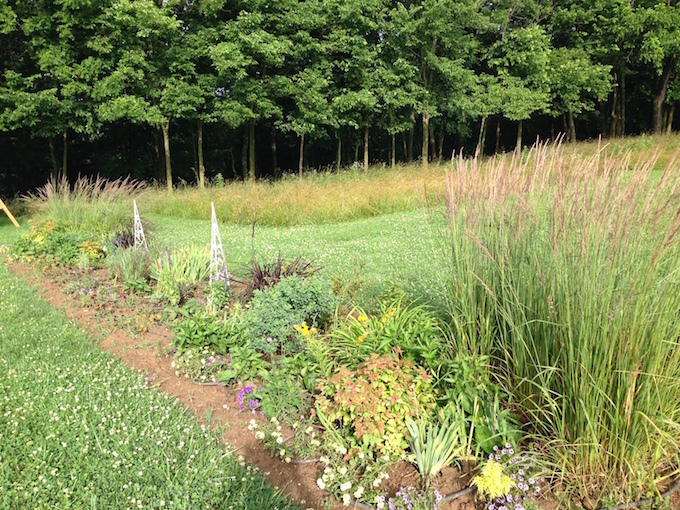 The "big bed" has yet to get even a single annual planted. Some of the ones in the "holding pen" are headed this way. If I'm not too late to find them in the garden center, I want to add a a few perennials too. Even without annuals there is a lot happening here. 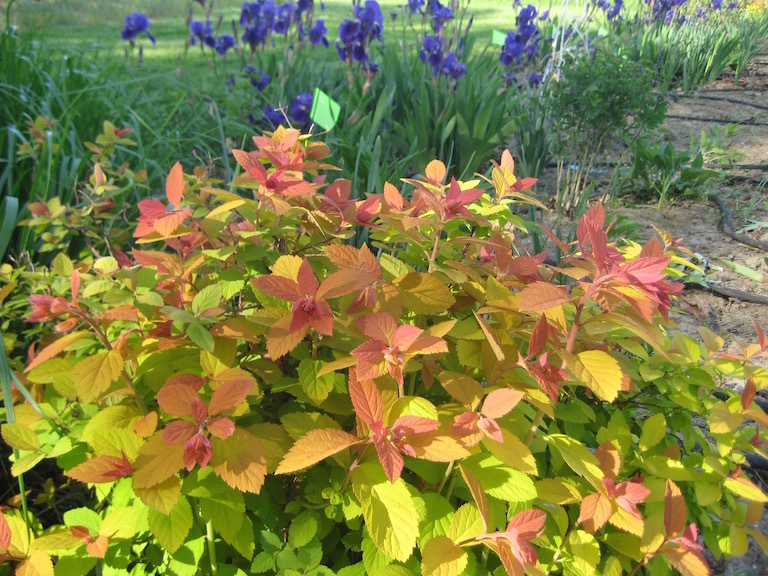 The left photo shows Double Play® Big Bang Spiraea now just beginning to flower. 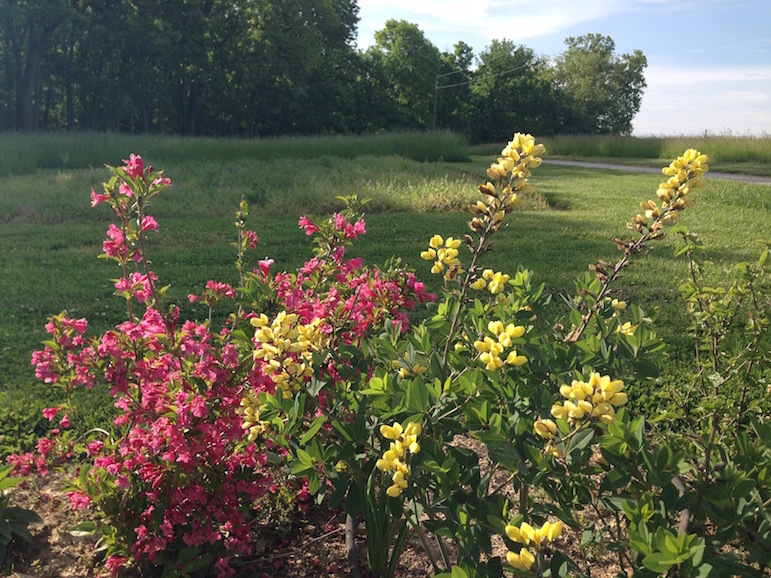 The middle photo is of Decadence® 'Lemon Meringue' Baptisia (I'm on the prowl for four more to add to this bed) next to Sonic Bloom® Pink Weigela. I wish I was a better photographer because the color combination of these two shades of pink and yellow is really great. In addition to the 3.5 inches of rain last week, we've gotten an inch over the past two days and it has turned sultry out there. I need some dry time, so I can try to plant on Sunday! Update - literally 30 minutes after I wrote this it started to thunder and then poured rain while the wind blew like crazy. I guess I should have guessed that would happen! The holly bushes are in full flower. Stunning aren't they? They really are in full flower, but stunning isn't the word I'd use. 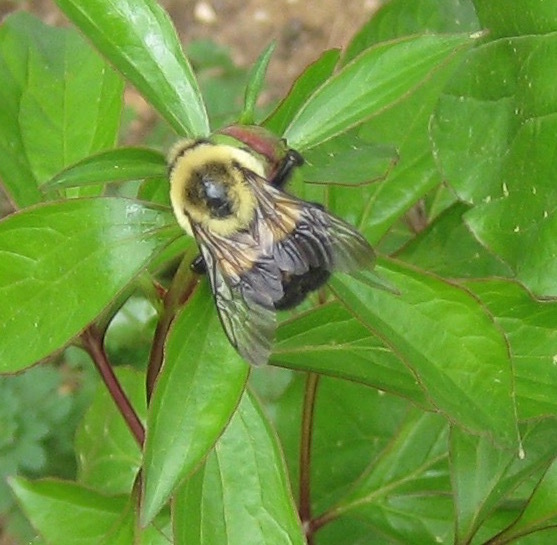 What is really cool is the bee population that inhabits these shrubs while they are in bloom. If it is daytime, then every time I get close at this time of year they are literally humming/buzzing. If the sun isn't out the bees are not out gathering pollen. I am not the least bit allergic to bee or wasp stings or mosquito bites for that matter, so having them around doesn't bother me and they do seem to leave me alone. Now, if you are allergic to bee stings, I can understand being reticent to plant these shrubs. But, don't use that as reason not to plant holly bushes. 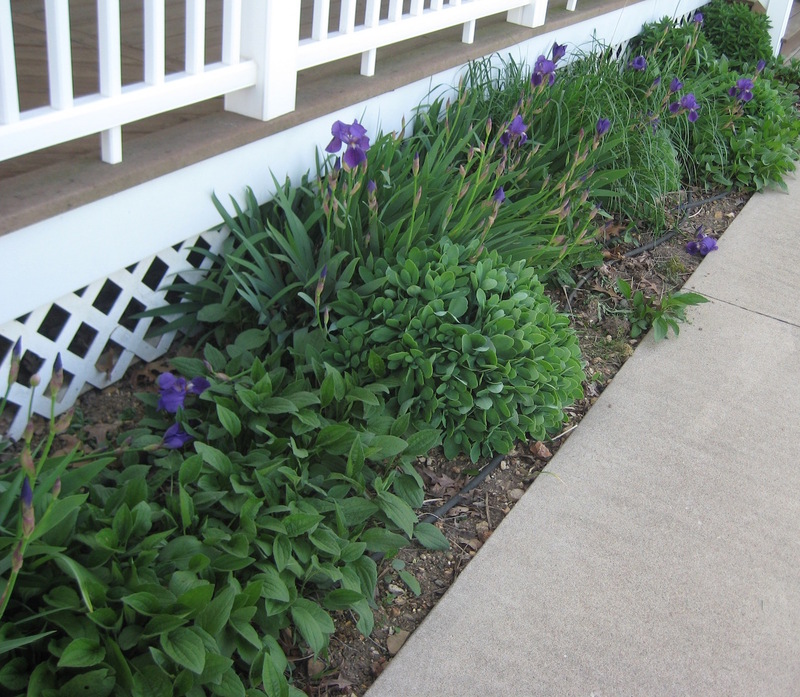 They bloom for a very short period of time and are great additions to the landscape. For instance, I am 99% sure that a pair of Cardinals have a nest in our bushes. I've startled both male and female cardinals out of these shrubs multiple times over the past couple of months. I've resisted the urge to go looking for a next and babies, but just barely! So they provide great cover for nesting birds - at least in my experience! 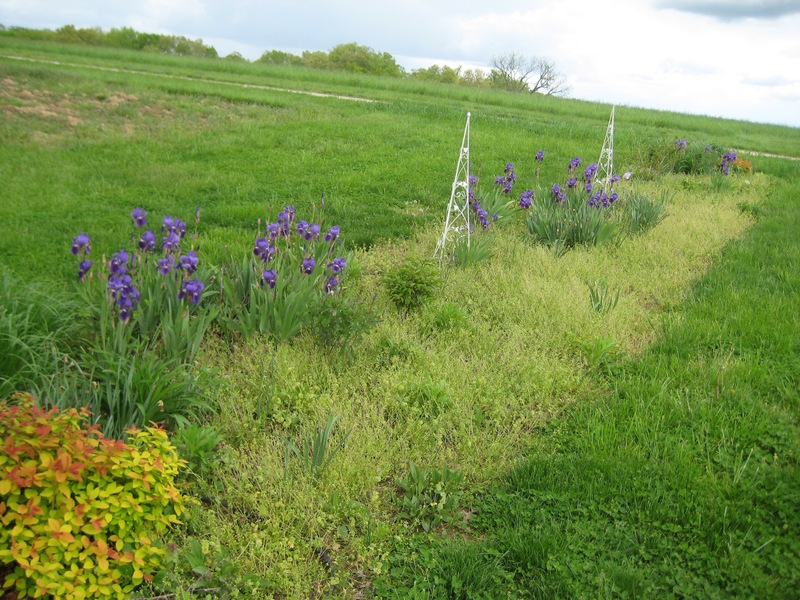 Have you ever wondered what your garden would look like if you flat out ignored it for the first months of spring? Well, wonder no more. Due to a combination of Easter (two weekends worth of events to attend), weather and travel It took until last weekend to weed my large planting bed. 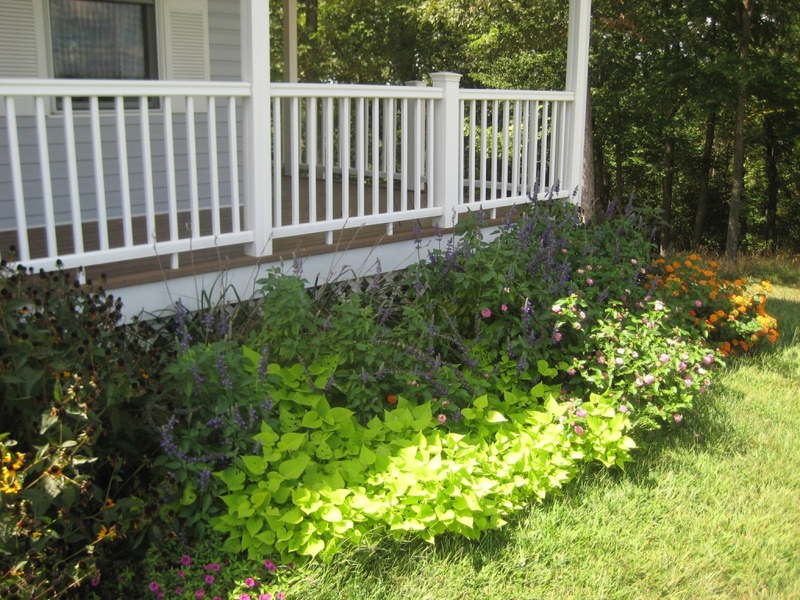 Take a look at the photo on the left below - that's not some cool chartreuse colored groundcover you are seeing, that is a carpet of weeds, mostly henbit, but some others too. The picture on the right, shows the newly weeded bed. 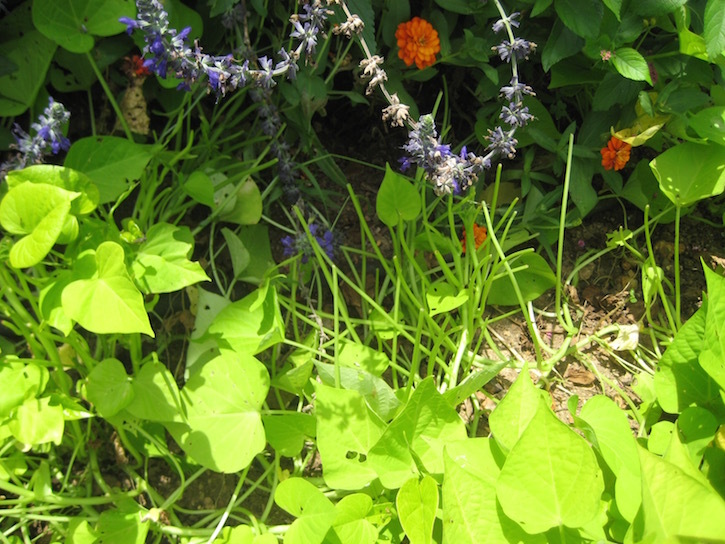 What a difference a heaping wheelbarrow full of wilted weeds makes! So, if your garden has a few weeds - you are not alone. If nothing else, you can look at yours and know that it can't be worse than mine! 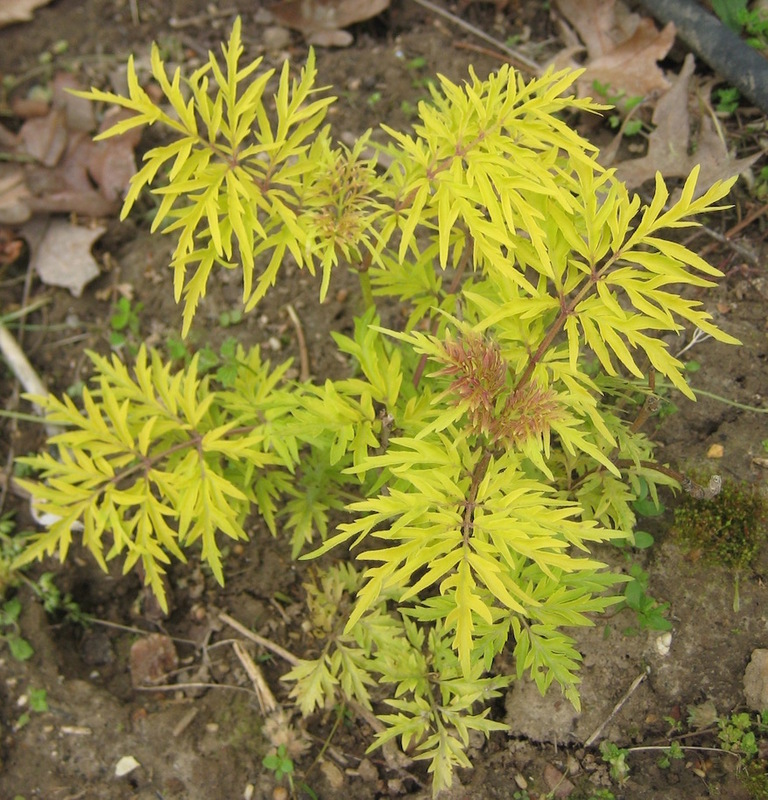 Lemony Lace™ Sambucus - I planted this one last fall - the deer munched it, but it has bounced back really well. I love the color and texture. 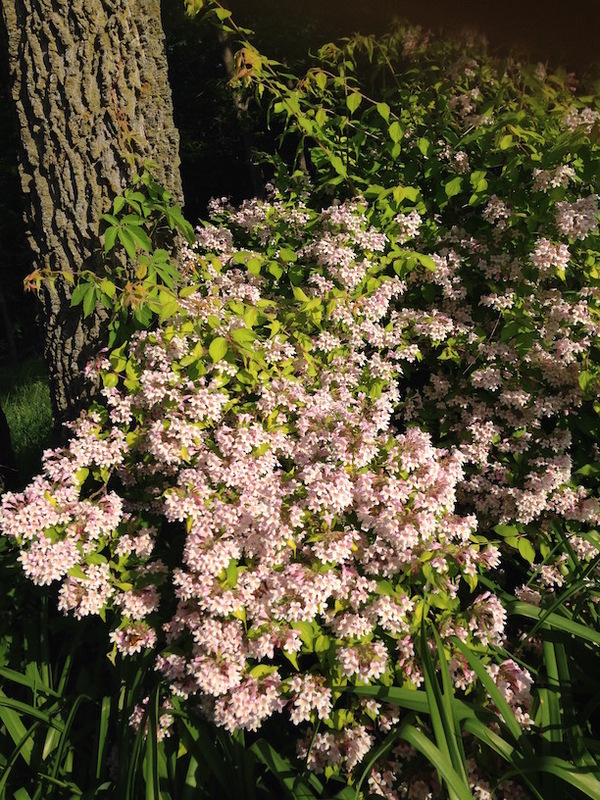 Double Play® Big Bang Spiraea - Most of my shrubs seem to take 3 years to really get settled in and performing well. 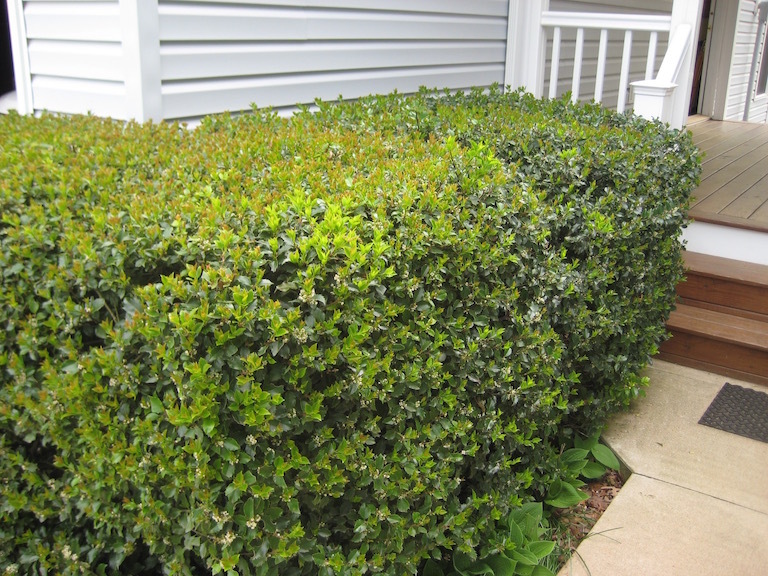 Don't discount a newly planted shrub until you give it at least 3 years to get settled, establish roots and then put more energy into top growth. 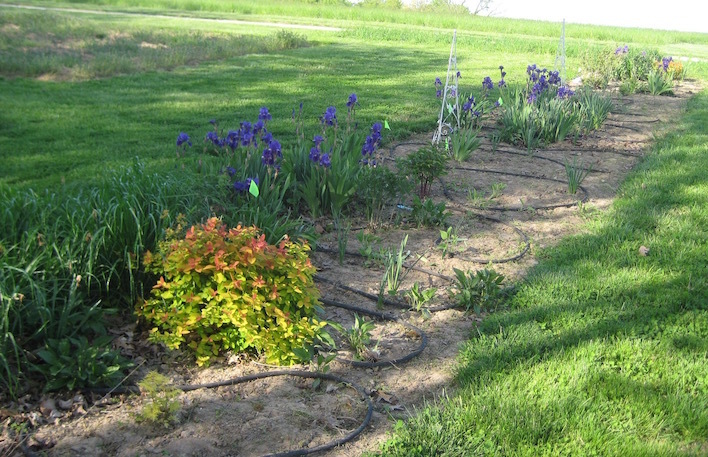 You can help shorten that adjustment period by really giving them top-notch care - which mostly means adequate supplemental water while they really grow their roots. The photo doesn't really do the color justice - those orange-red tips on the foliage are awesome! You might see a green flag in the background. I find flags really handy to mark newly emerging plants so i don't forget about them and the space they'll need to grow, when I get busy planting new purchases. These newly emerging plants are also why I like to weed by hand in spring, I'm much less likely to accidentally take out a plant that is trying to make a comeback. Decadence® 'Lemon Meringue' Baptisia - I love prairie plants because they are tough and really well suited to my Missouri garden. The Decadence® Baptisia is one of my new favorites. I planted two last year and they did great. They are looking fantastic again this spring - they are budded with the buds just starting to crack color. 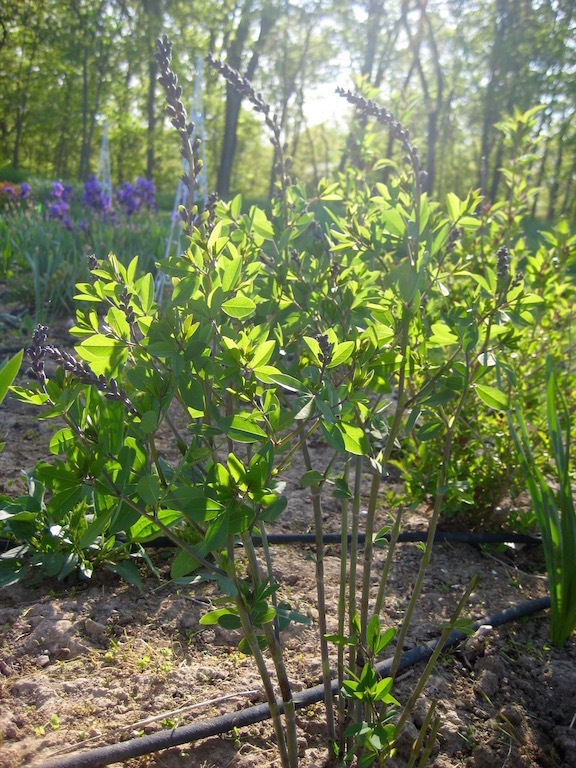 If you've grown Baptisia (False Indigo) in the past, they are compact and really wonderful. 'Sweet Summer Love' Clematis - I received two plants of this one as new variety samples last year and put them straight into the garden. I really need to get larger obelisks for them, but this is what I was able to find last year. These two sat there all summer and appeared to do absolutely nothing other than survive. However, they were really growing like crazy - it's just that it was root growth, not top growth. 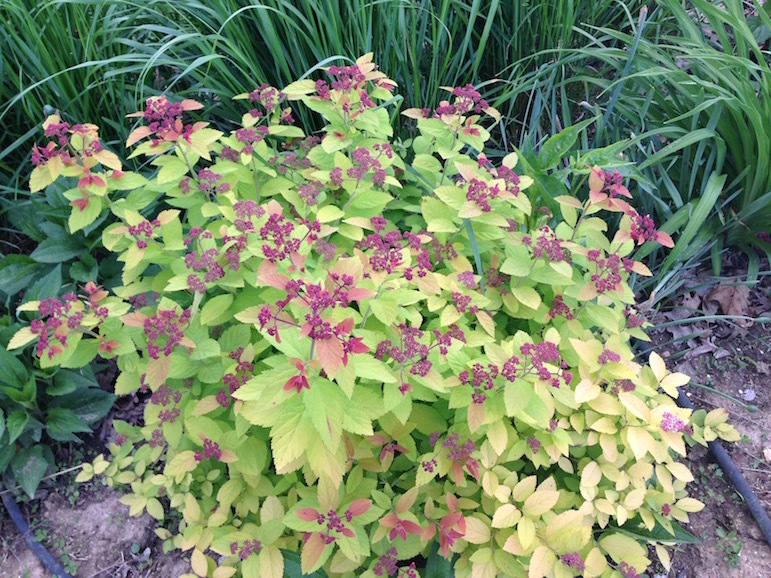 With perennials and shrubs don't assume that just because you can't see anything happening, there isn't anything happening in that first year or two. It might be subterranean growth, but those roots are really important to long term health and growth. These two started spring with a bang. I can't wait to see them bloom this summer! As usual the honeysuckle (left) is putting on a display and our resident hummingbirds are already sipping at the bounty being offered. This weekend I am going to be buying some Vermillionaire™ Cuphea to plant nearby, which the hummingbirds also love - my attempt to give them a little slice of Eden in my garden. 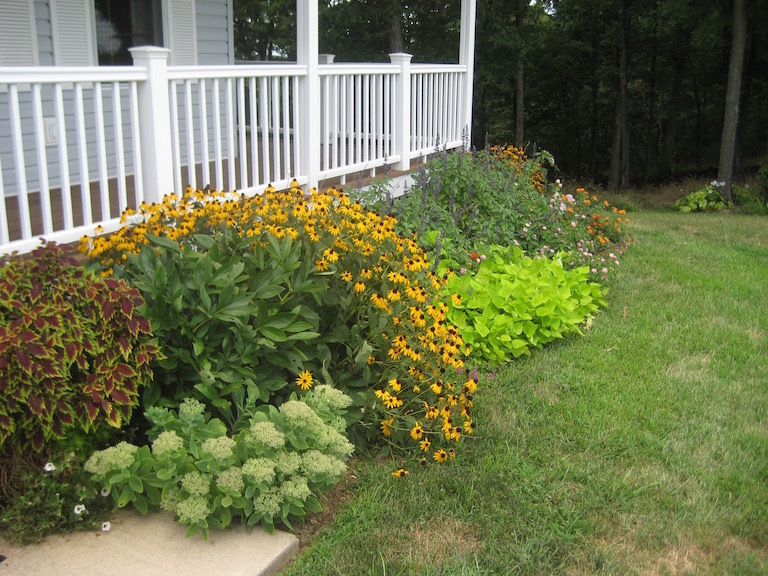 This bed in front of the porch (right) isn't showing much color - just a few Iris - but the Rudbeckia are growing as are the Neon Sedum - promises of good things to come! 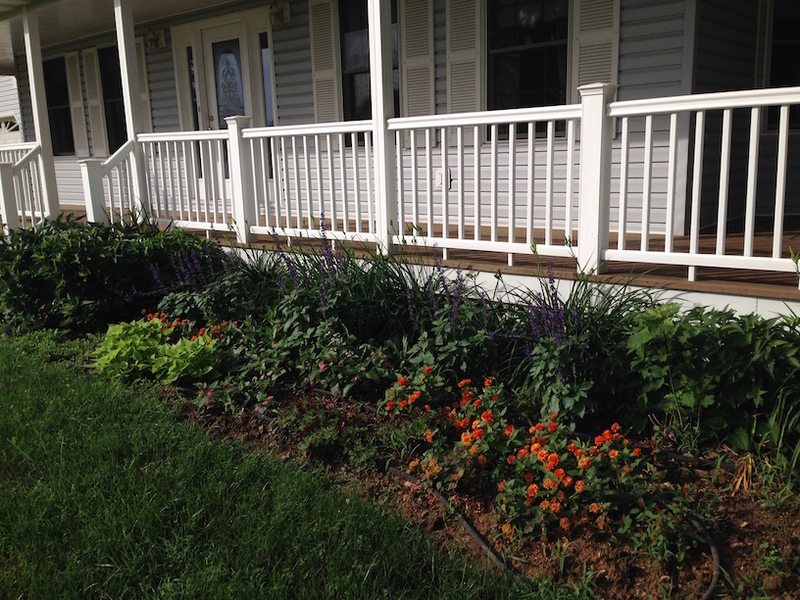 Thank you for posting photos of your garden through the growing season and comments on the plants you are trialing. 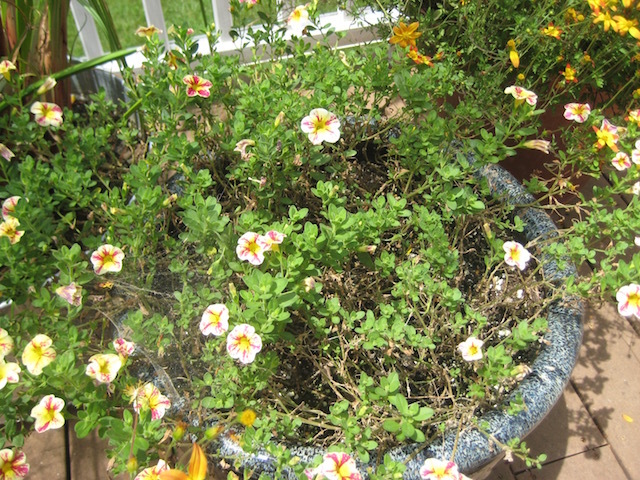 I don't plant in containers, and I am new to the world of Calibrachoa. I fell in love with Calibrachoa in the summer of 2014 during a visit to the Penn State Trial Gardens in Lancaster County, Pennsylvania. This spring I planted seven of them in the ground in my garden, not realing that they are really meant to be planted in containers. Six of them did fabulously well, and the butterflies love them. I wish I could post photos here. The only casualty was a pink Callibrachoa that I planted on a slope. 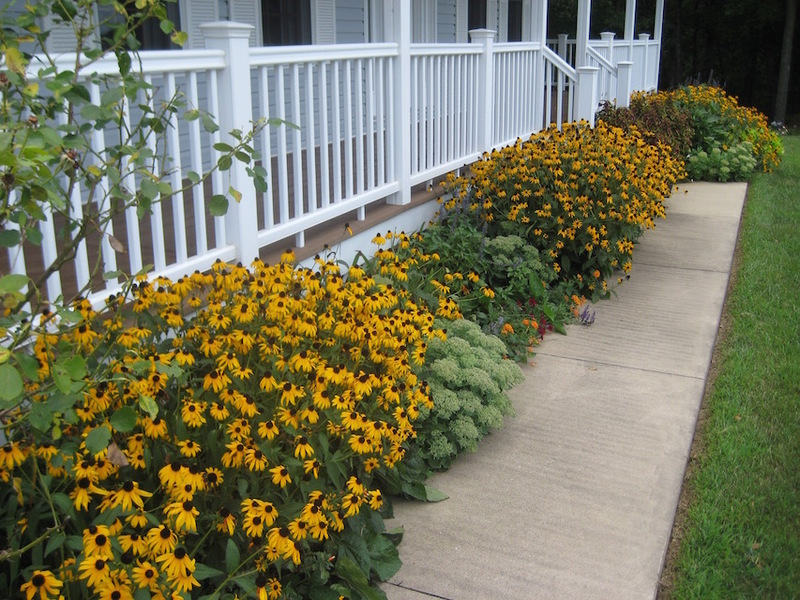 I love your black eyed susans and would like to get some established in my Sauk Rapids MN (Zone 3-4) garden. 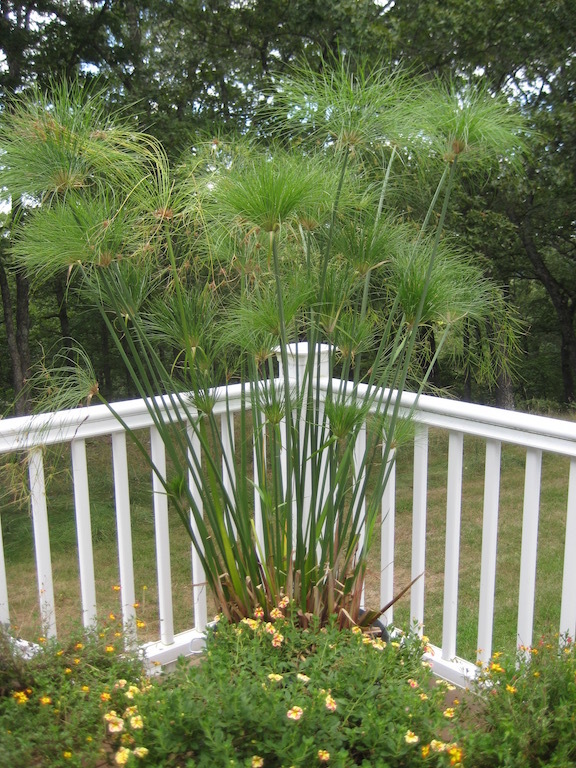 What is the botanical name and Proven Winners name of the plant? I've used two different Black-eyed Susans in my garden. 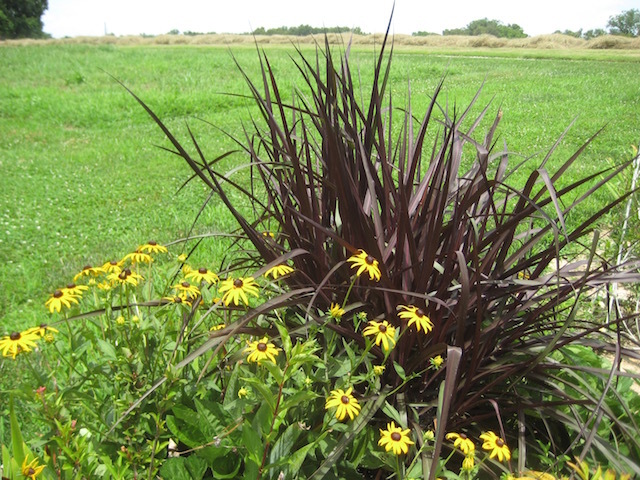 Both are Rudbeckia fulgida. One is called Goldsturm and the other is Viette's Little Suzy. Both should be hardy to zone 3. Thanks, Ida! I enjoy sharing my garden. 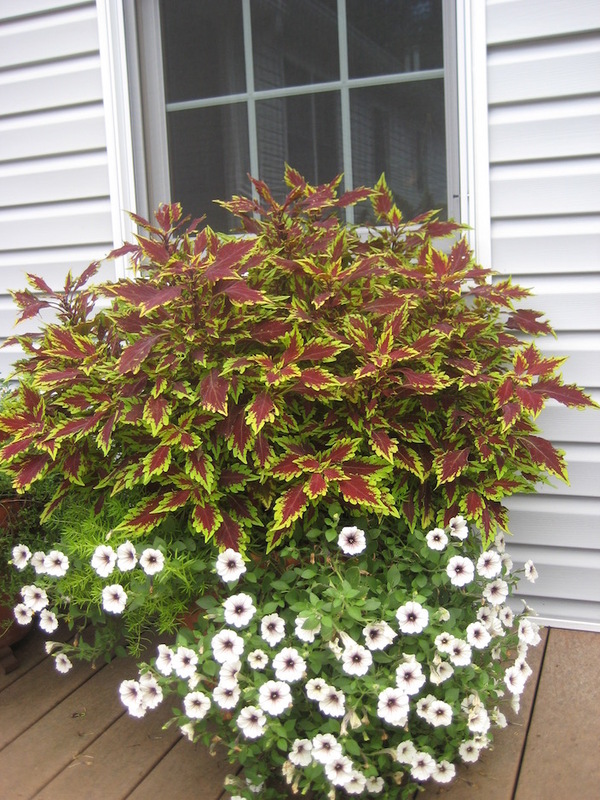 I love your newsletters and seeing the pictures of the plants in your gardens. You have so many wonderful things. Lots of work but also lots of fun. What a great job you have. It'd be nice if the weather cooperated more. Here in NJ we've been having some beautiful, cool days and nights but we do need rain. A nice, long, soaking rain would be wonderful. Now my question. 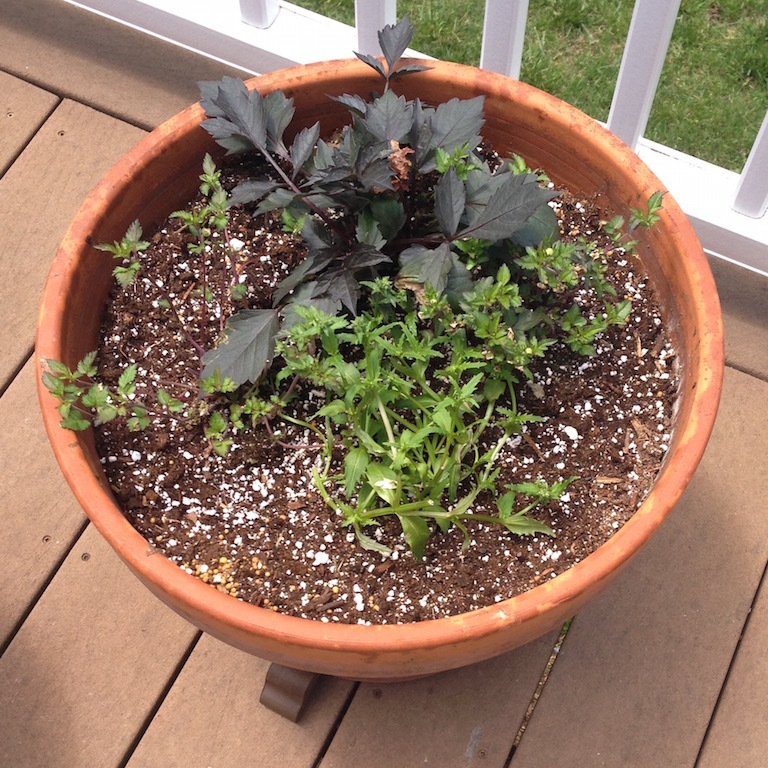 I got a Little Tut plant in the Spring and put the whole pot it's in in a larger pot with no holes and filled it with water. The plant did well at first but now the fronds seem to be turning white and fluffy and I don't know what to do. Should it be completely submerged in water? They can grow in the edge of ponds, so they can be submerged in water, but I think there is a difference between a pond or other larger body of water and a container. The difference being oxygenation. So I do think it would be best to make sure that the plant isn't completely submerged all of the time in water. Maybe keep the water level half way up the soil level? that way the plant would have constant water but the upper roots would have better access to oxygen. See if that helps perk it up. Also, if you haven't been fertilizing, I would start using a water soluble fertilizer once a week or so. 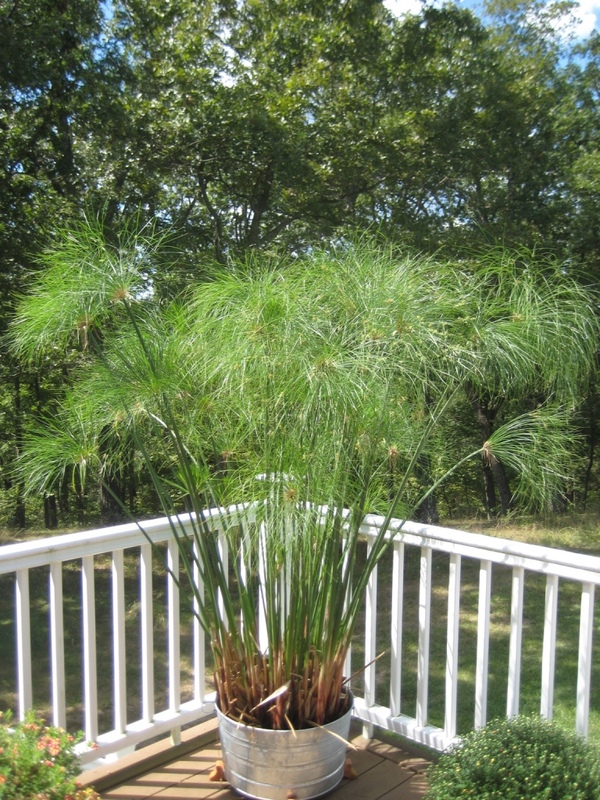 I know my King Tut usually needs a fertilizer boost starting around the 4th of July - I can tell because the fronds start to look a bit yellow. Fertilizer gets it back to green pretty quickly. 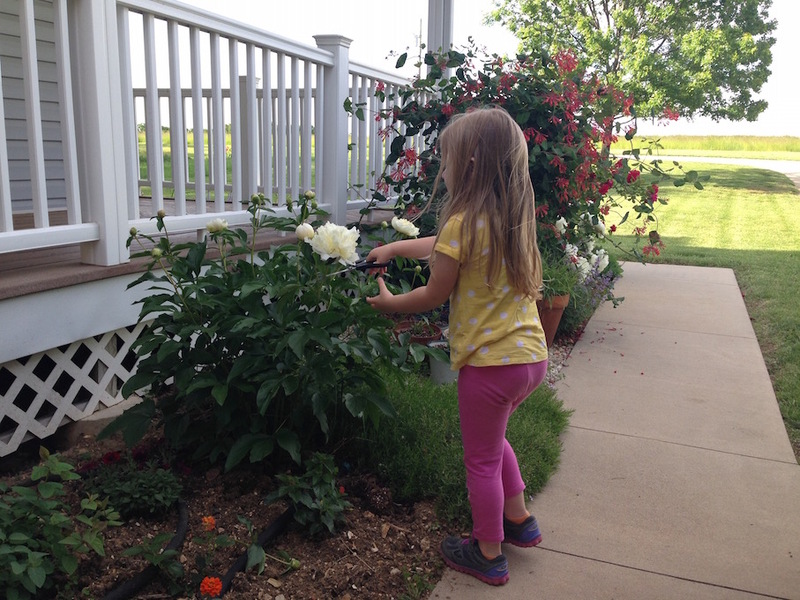 I love seeing pictures of your gardens & I'm happy that your daughter is interested in them too. 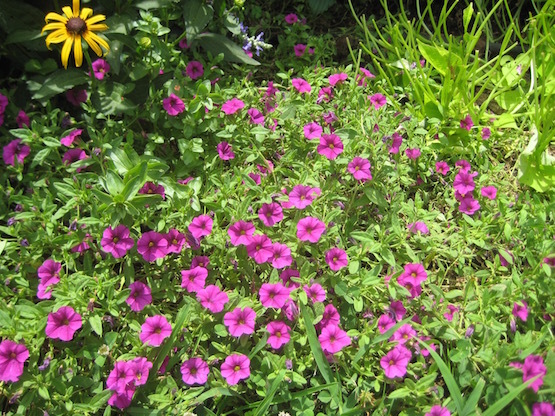 i have some vinca flowers that are mostly green & hardly flowering. What is my problem? Thank you. I enjoy your letters and especially the pictures with the names of the plants. I tried your idea of putting plastic under the soil and flowers in the wire hanging baskets that are lined with dry coconut fiber. My hanging baskets are doing better since the plastic helps the water stay in. My garden is behind where it usually is too because of all the rain here in NW Kansas. Still planting! 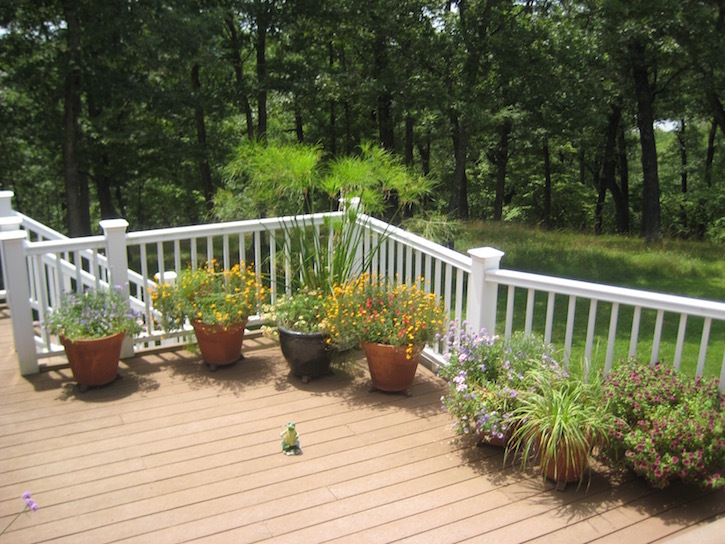 I hope now that it has turned toasty and humid, your plants are still thriving. it's 95 today with what seems like 95% humidity, but that might be a slight exaggeration! We did finally dry out, to the point that I could now use an inch of rain! Oh my rain! Your story is our story too, rain rain go away. Our grass is green but soaked. 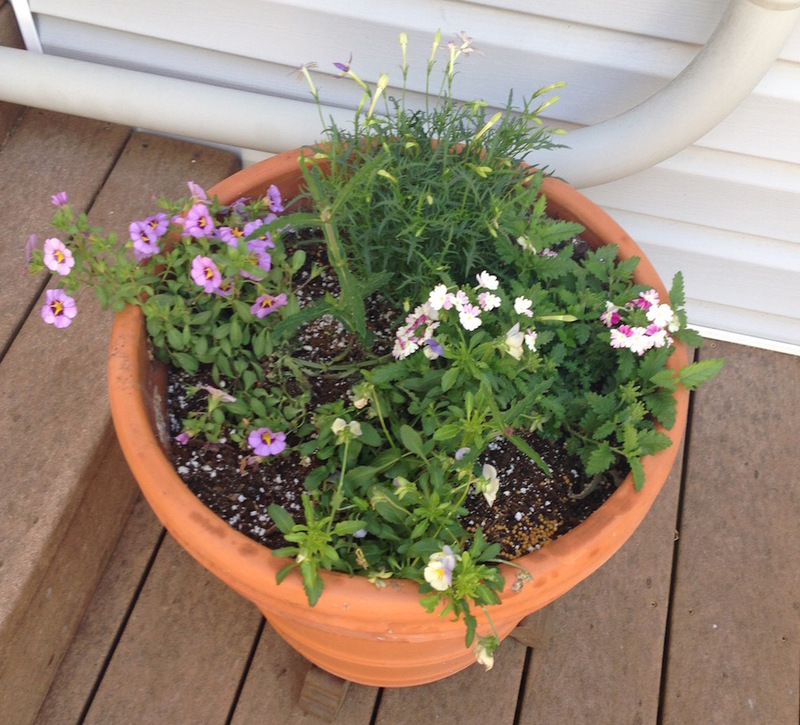 I have put just a little water with Miracle Grow on top of soil in my porch pots, not a full water.... just a little. I hoping when all this rain finally stops here in the Finger Lakes of NY the fertilizer makes it all the way through the plants. So far all is well and I'm already getting great compliments from the neighbors. The sun is out today and tomorrow yeahhhhh! I live in Illinois and we got hammered with rain as well. My weeds are out of control. Tree weeds especially have gotten too big to be able to pull with the whole root intact. My Black Beauty Sambucus is also really liking the wet weather. It has gotten so big in such a short amount of time! That is a great question! Ask that question in our feedback and a plant expert will get back to you!